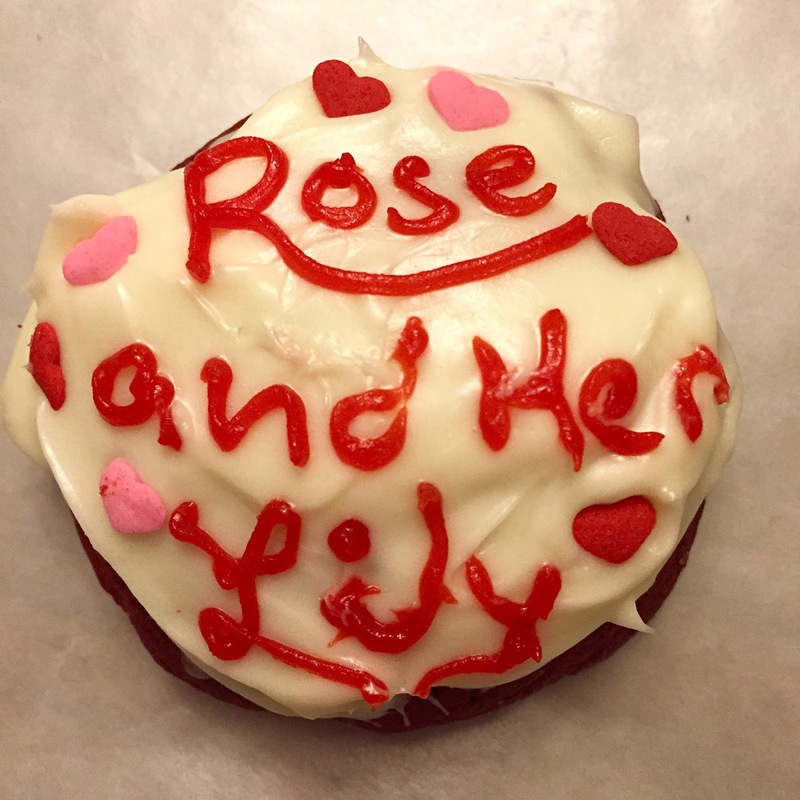 Rose and Her Lily: Lily's 7th Birthday Celebration! 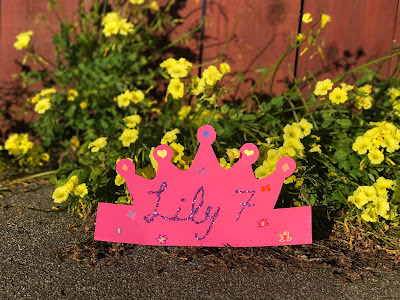 Lily Katherine's 7th birthday celebration has lasted all of March and has been incredibly special! Just when I think enough years have passed that maybe people won't care anymore and I will be left alone to celebrate and remember my beautiful girl, I am blown away by the amount of love and support I've received, and by those who love my precious princess in Heaven too. For the past few years, I've wanted to spend Lily's special day at the beach, specifically the Carolina Coast where Lily went on one of her many adventures on Earth. 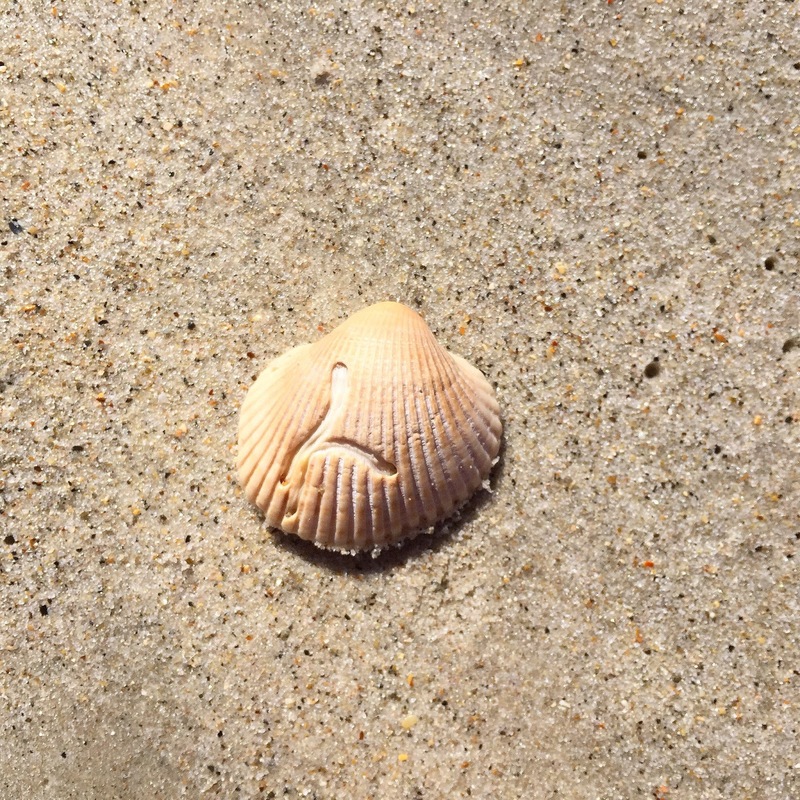 The beach is a soothing and comforting place where I feel close to God. 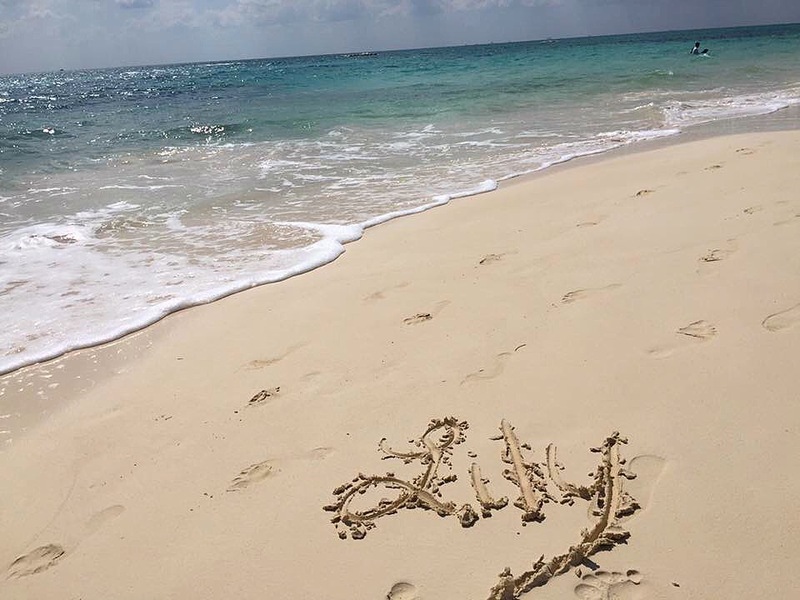 I knew it would be a beautiful way to spend Lily's day and it was! I'm thankful it worked out to go this year finally. 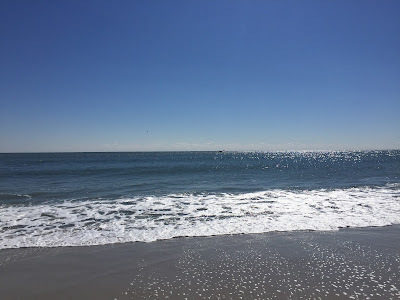 It's a blessing to live only 2-ish hours from the beach. We went to Carolina Beach, North Carolina. 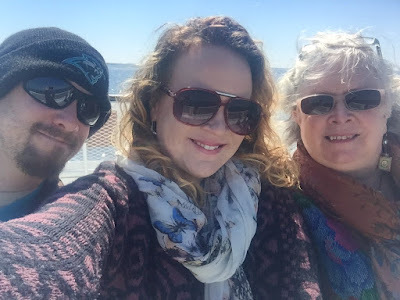 My mom, brother Adam, and I went together. We drove down on the 15th and stayed through the 17th. It was a bit chillier than I hoped because it can oftentimes be quite warm in mid-March in North Carolina, but it can also be still cold. You never quite know what to expect. 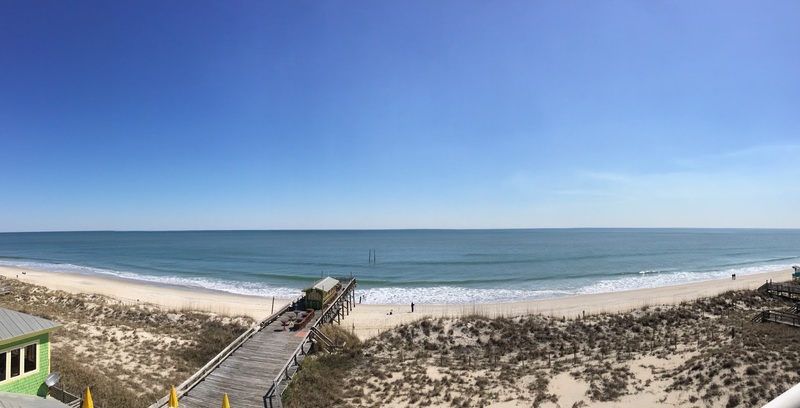 I prefer the beach in the Spring and Fall, but with lower 70s as the temperature. 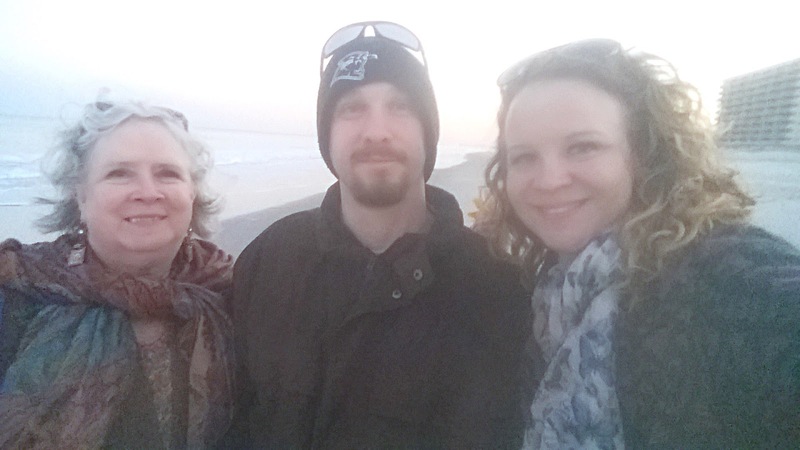 It was in the upper 40s and lower 50s while we were there this trip. 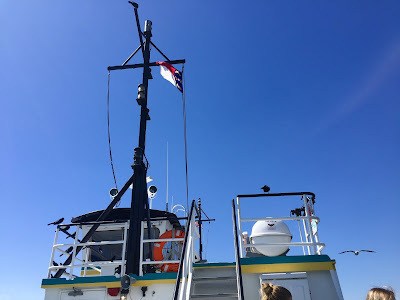 However, it was sunny with blues skies and no rain, so that's what I was most wanting and thankful for. 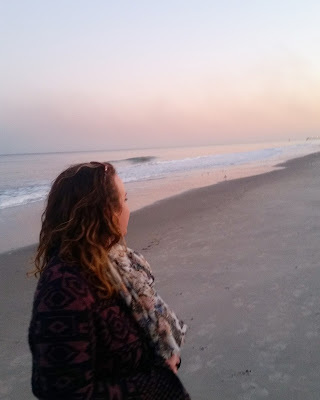 Even though it was chilly, it was still the beach and still fabulous! 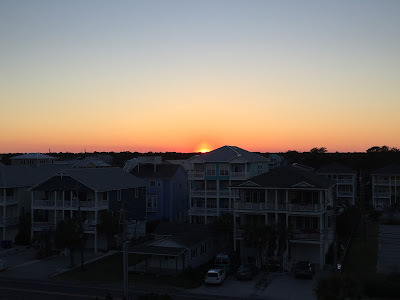 On the first evening we were there, we enjoyed in our hotel, with our balcony overlooking the Atlantic Ocean. Adam and I picked up some groceries and some Michaelangelo's Pizza (a beach favorite) for dinner. We watched HGTV hehe (a treat since we don't have cable) and just enjoyed hanging out. 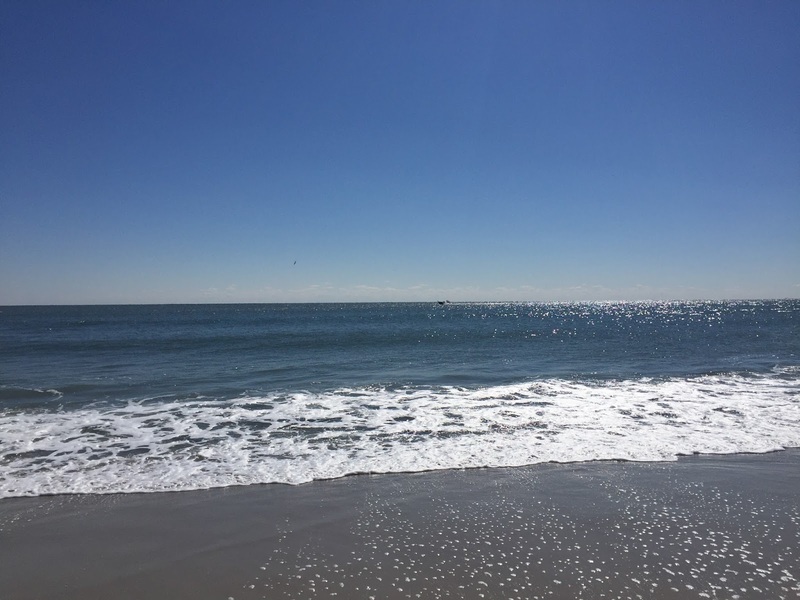 This March 16th was a beautiful one. I told my mom and Adam that Lily's birthday means more to me than any other day, even my own birthday. Yes, I get sad and reflective, but it so much more than that. It's like God highlights the day and somehow just makes it feel so special and magical, from start to finish. He hides treasures throughout the day, waiting to be discovered, which you will read about in a moment. 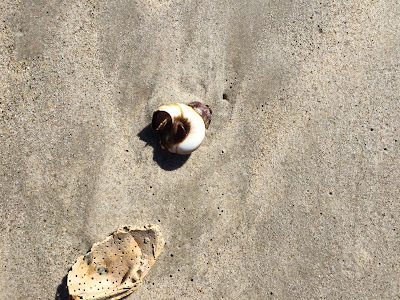 As I said, the beach is so healing, tranquil, and soothing to my soul. 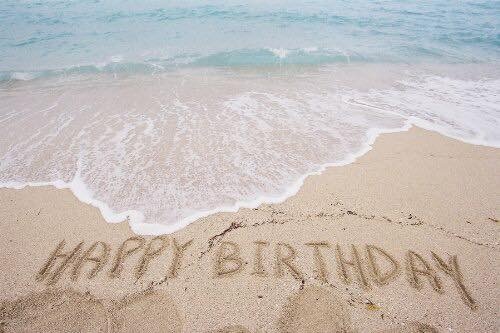 That has made this birthday even more special. But honestly I could sit at home all day and still March 16th would be marked as sacred... and so, so sweet. 7 years out and the sweetness outweighs the bitter in bittersweet, without comparison. I love you, my sweetheart. I know you are safe. I'm forever thankful you are mine and I am yours. We had breakfast and then Adam and I went down to the shore to work on my birthday project. 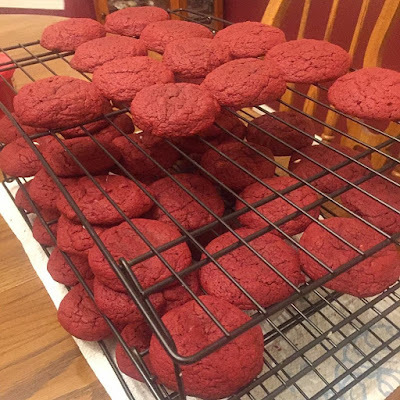 Each year in honor of Lily for her birthday, I like to have some sort of project. 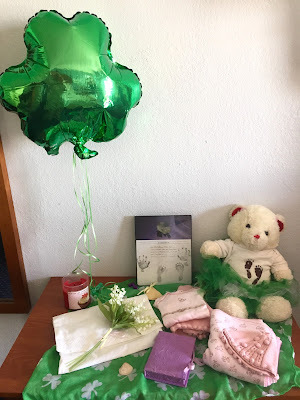 The last couple years, it was preparing my comfort boxes to donate to the local hospital where Lily was born. I'm deeply grateful and touched that the hospital has now taken over the funding to provide the boxes to the patients who experience loss within those same walls where my girl was birthed. But, I was left not knowing what to do this year. 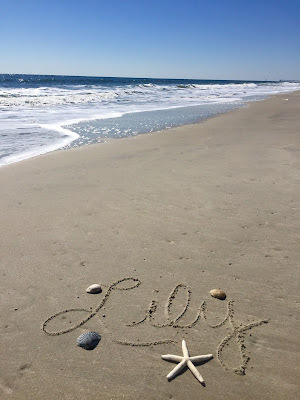 Until I realized I would finally be able to make it to the beach and so I decided for my project this year that I would write the names of Lily's friends in Heaven and photograph them as keepsakes for their families. To honor multiple babies at once. To let them know their children aren't forgotten. 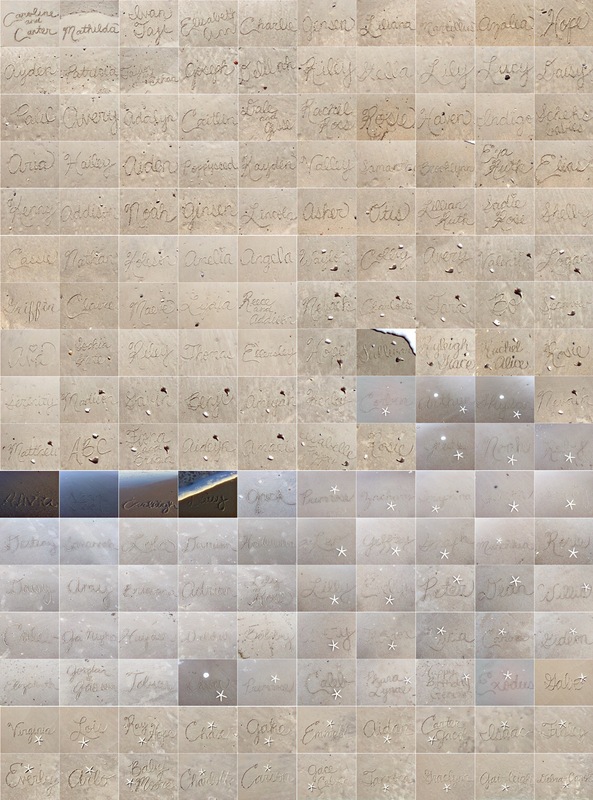 I wrote around 200 names in the sand (including twins). The names are several babies that I know their families personally, as well as babies who were born in the month of March (I wanted to do something special for those who share Lily's birth month). 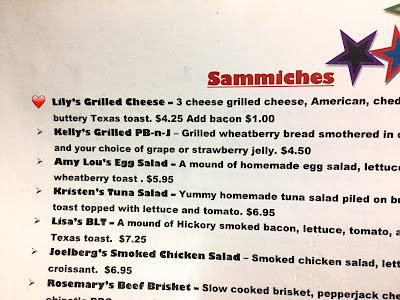 I would have written more, given the time. 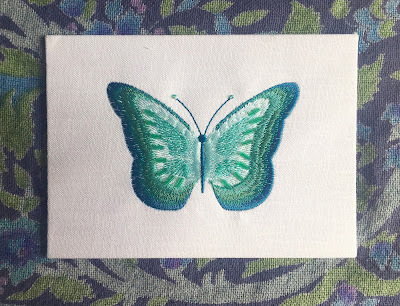 What I wish is that I could write every name of every baby who has family on Earth who feels their absence. 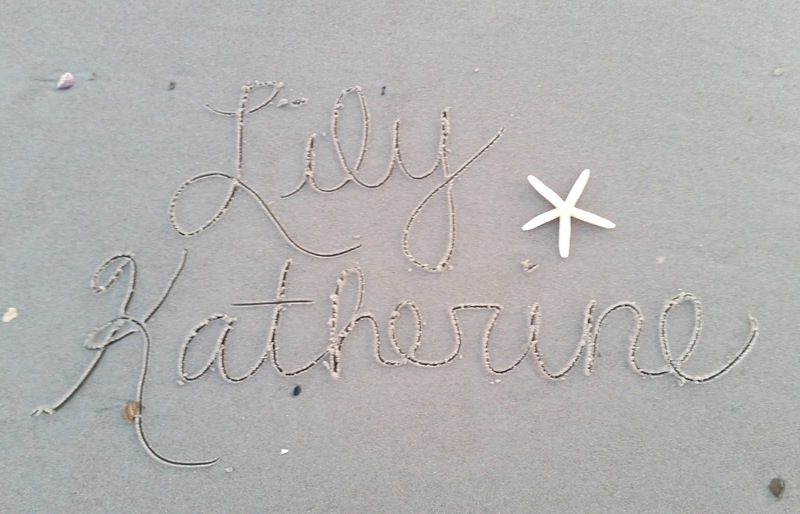 If I wasn't able to get to writing your baby's name, I'm sorry. Here are some of the photos I was able to capture, with love from and for Lily. 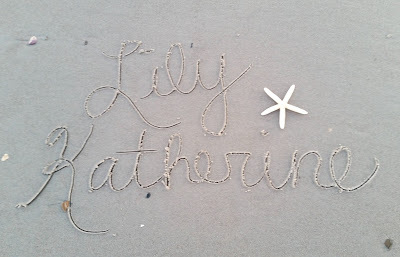 After writing quite a few names, we decided it was time to get ready for the day, as we had other activities planned. 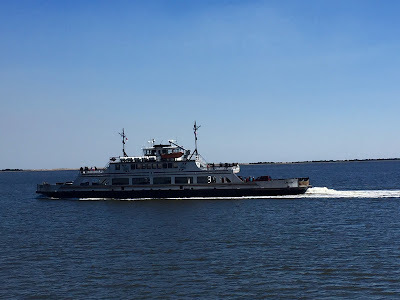 One of the main reasons I like going to Carolina Beach, besides the fact that it's close to home, is quiet and has cute places to peruse, is that it's close to the charming and quaint town of Southport, which you get to by Ferry! 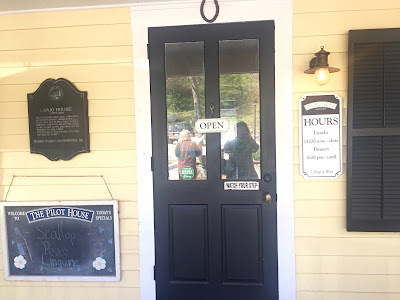 This town has had many movies made there because of it's picturesque quality. 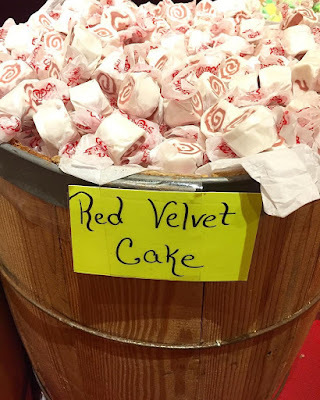 When we got into Southport, we were all hungry and I knew I wanted to have lunch at a place called Moore Street Market, where I've eaten several times. 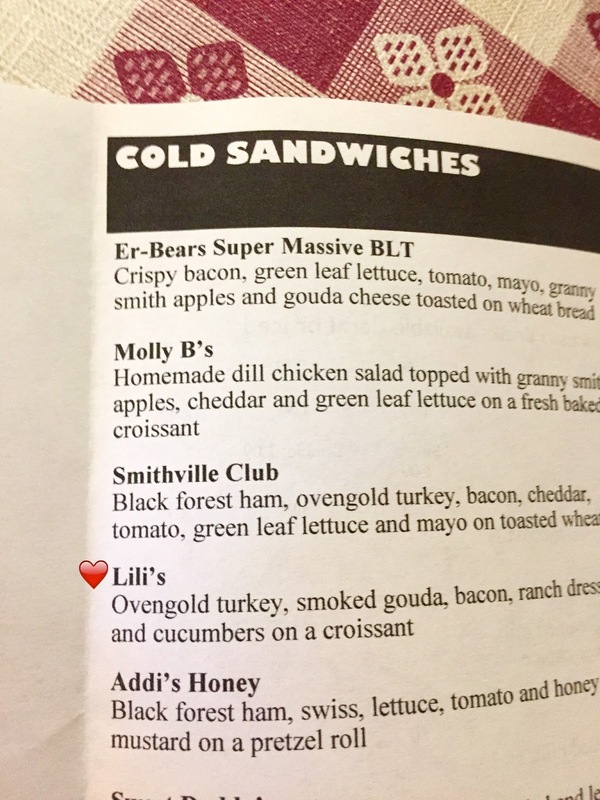 I took a couple friends and my sister there 2 1/2 years ago and had a sandwich called "Lili's!" 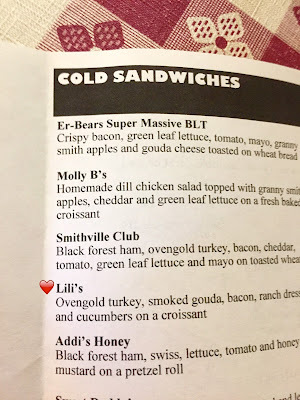 So all three of us had some yummy drinks and Lili's sandwiches. I usually eat outside when I go there, but because of how chilly it was, we ate inside. 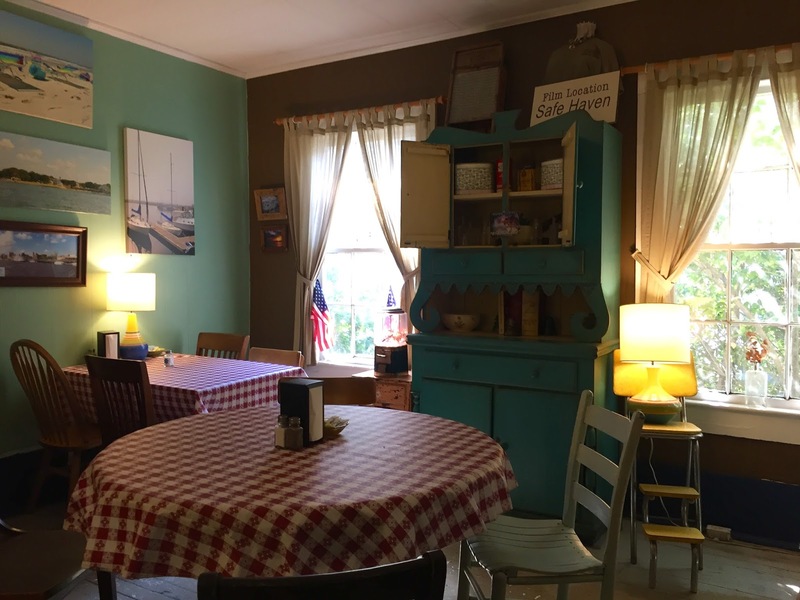 It was a cutely decorated room. 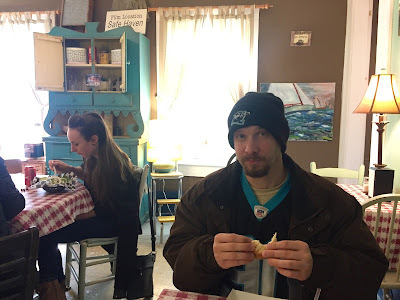 After eating, we looked around a bit in the adorable stores that Southport has to offer. 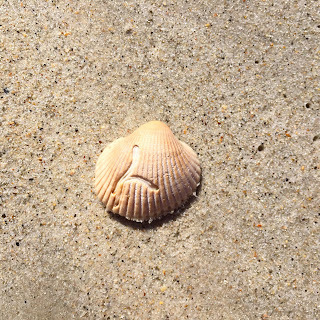 I found a sand dollar and starfish to use as props for my photos. 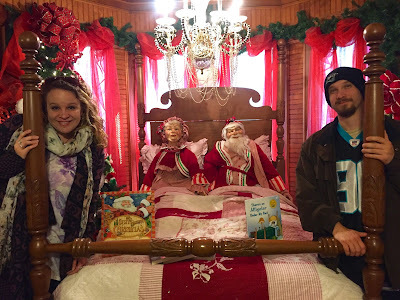 We went to an amazing store called "The Christmas House" where I found a couple things. With Adam in Santa's bedroom haha. 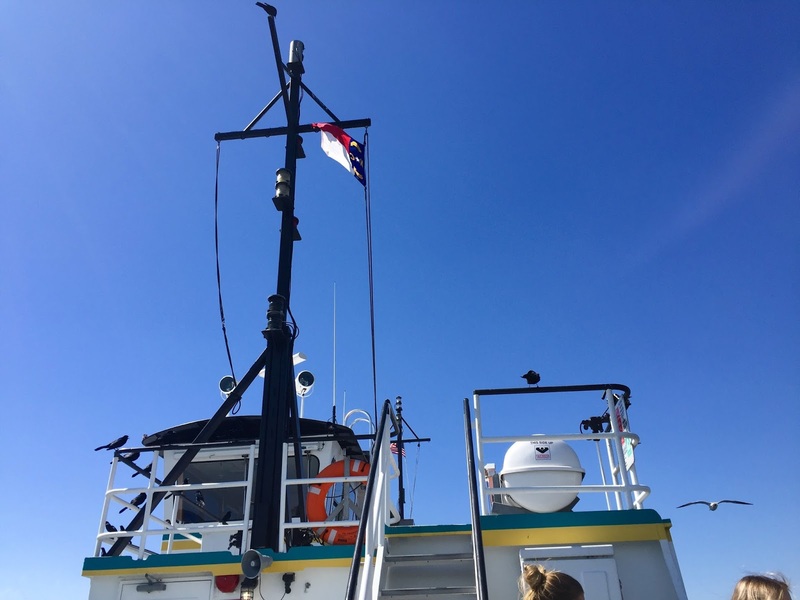 We were all getting tired, so we decided it was time for the next adventure. 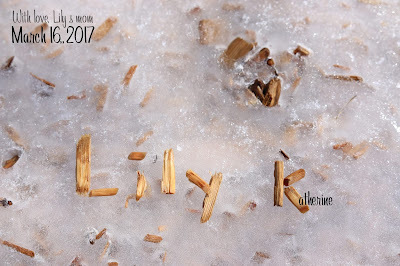 We went to the car and I realized it was almost Lily's birth minute - 4:24 p.m. I almost missed it and was thankful God reminded me about 5 minutes before. I like to light a candle and sing "Happy Birthday" to Lily each year on the minute she was born. It's a reflective and special moment. 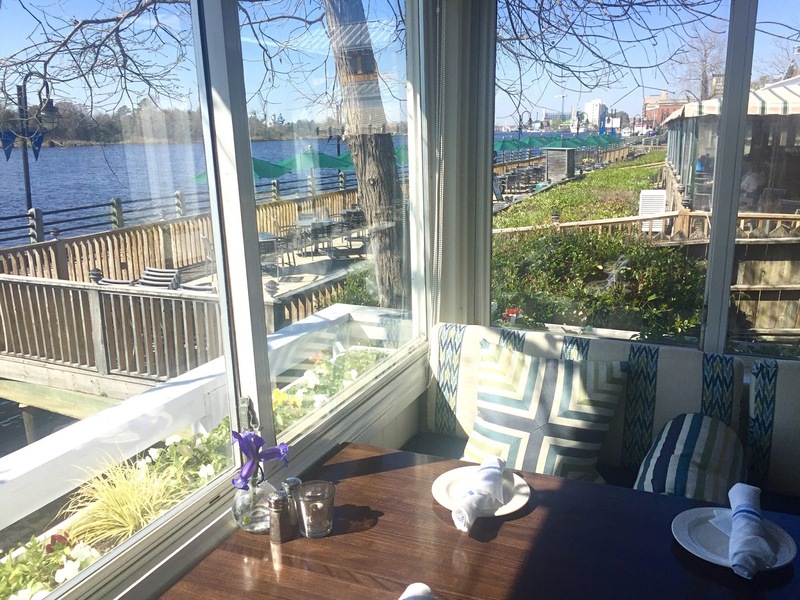 So we said we should go down to the water. We started driving, unsure of where to go. My mom said to just turn down a random street where we saw the water sparkling. We parked across the street from a swing we spotted and lit the red-velvet cupcake candle that is only used on special dates in time to sing. The wind kept blowing it out, until finally it lit and lasted for her special minute. We sang "Happy Birthday" to Lily, as well as a favorite of my families' that says, "Every day of the year, may you find Jesus near." Singing those words to her holds an entirely different meaning. 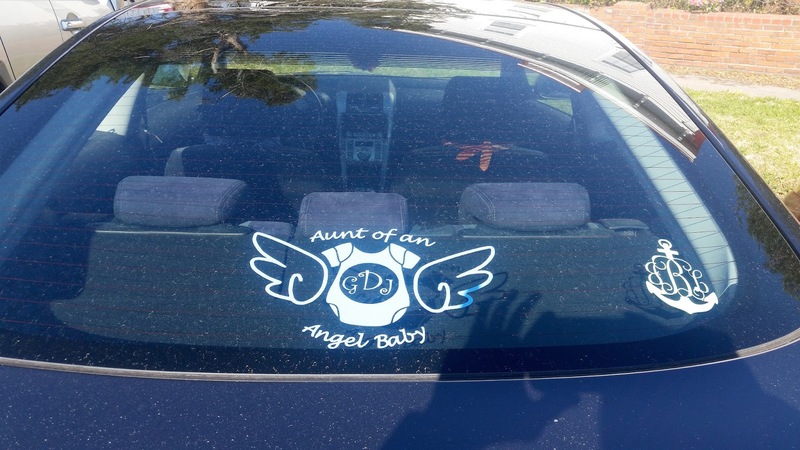 After that, we were walking back to the car when I spotted a sticker that said "Aunt of An Angel Baby." 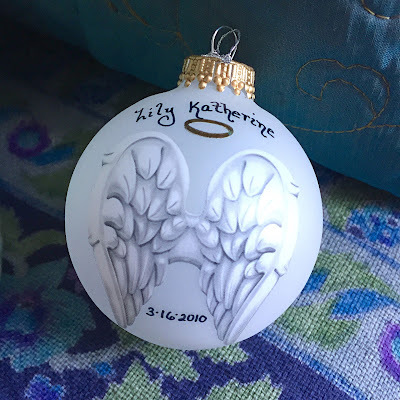 Right away I knew it must have been a precious baby like Lily that went to Heaven, with the term "angel baby." 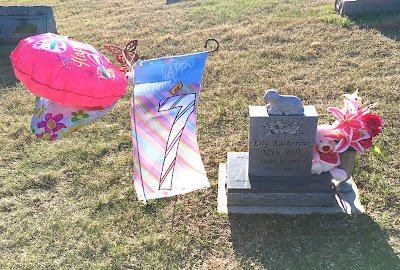 It touched my heart so deeply to see that on her birthday... like a reminder that we're never alone. And there's just this automatic connection with others who know this loss and love. I keep blog cards in my purse and spontaneously thought I should leave her one, along with a note. I wrote, "I happened to notice your aunt of an angel baby sticker and it touched my heart. I'm a mommy of one. 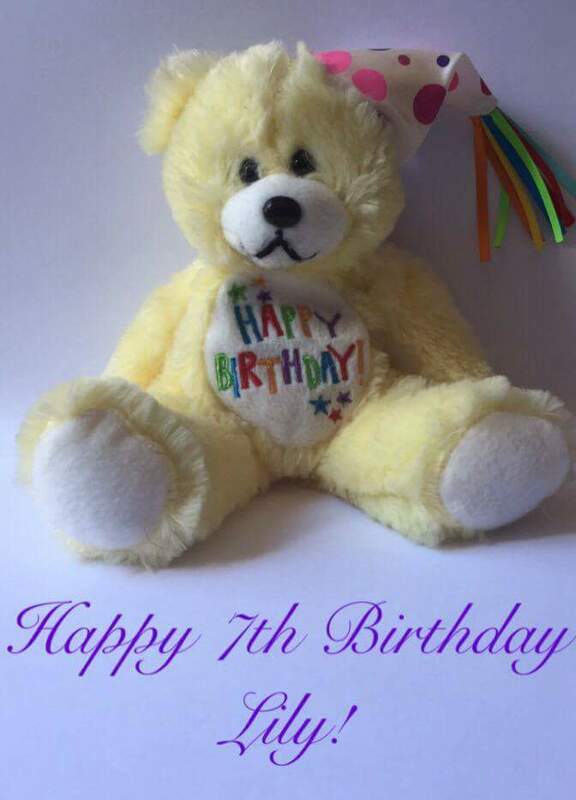 Today is her 7th birthday. Love, Hannah Rose." And I wrote on the front to please contact me so I could explain the story. 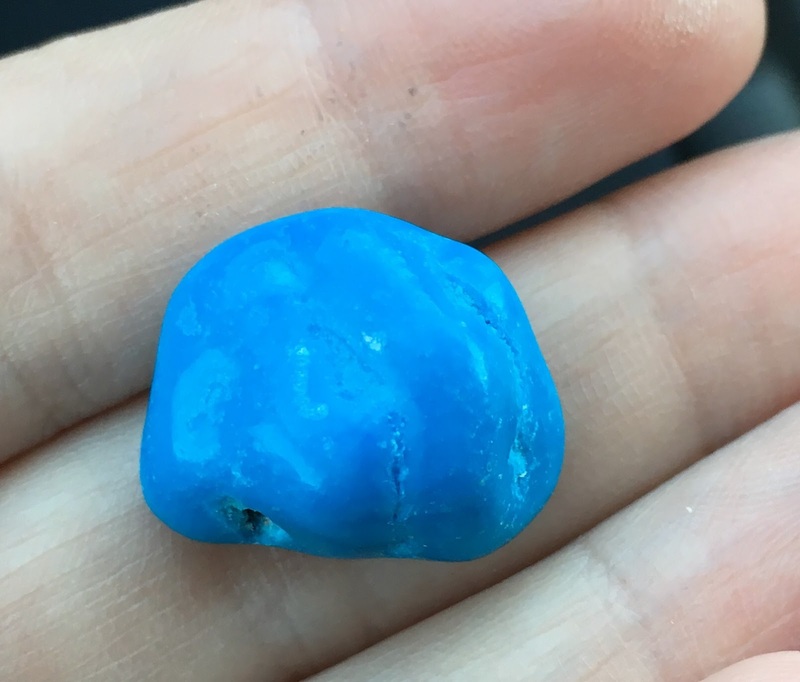 I tucked it into her driver seat window and prayed the wind wouldn't carry it away and that it'd end up safely in this auntie's hands. I hoped she truly would reach out. Little did I know she would write back so soon... I got an email from Jessica the next morning and she shared that her precious nephew Gabe slipped away just before birth too. He had a hole in his heart. And this auntie said the note came at just the right time, because her nephew had been on her mind, on what had been a tough day. 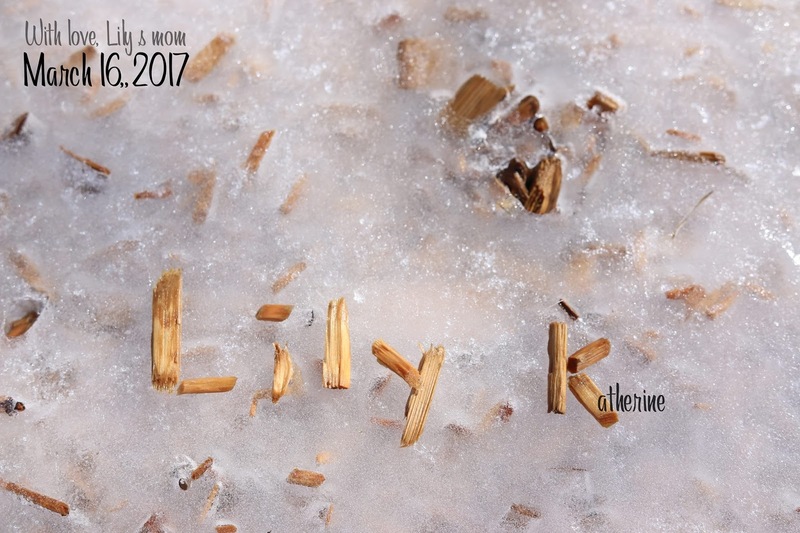 The 17th (the day after Lily's birthday) was the day she learned from her sister a year ago that her nephew's heart had stopped. And the 18th was his 1st birthday in Heaven. She said her family has turned to God through this too. We both want to keep in contact. Yet another baby to love, another March baby! God is amazing to have led me right there. He holds both of our cherished birthday babies and they are so safe and loved. We then drove back to take the Ferry back to the Fort Fisher side. 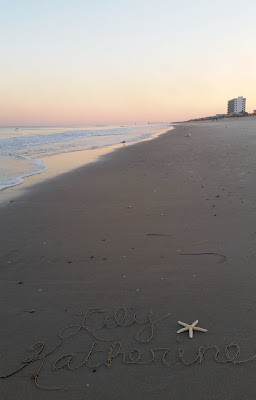 When we got back to the hotel, we rested a bit and then we all went down to the beach where we wrote some more names in the sand. 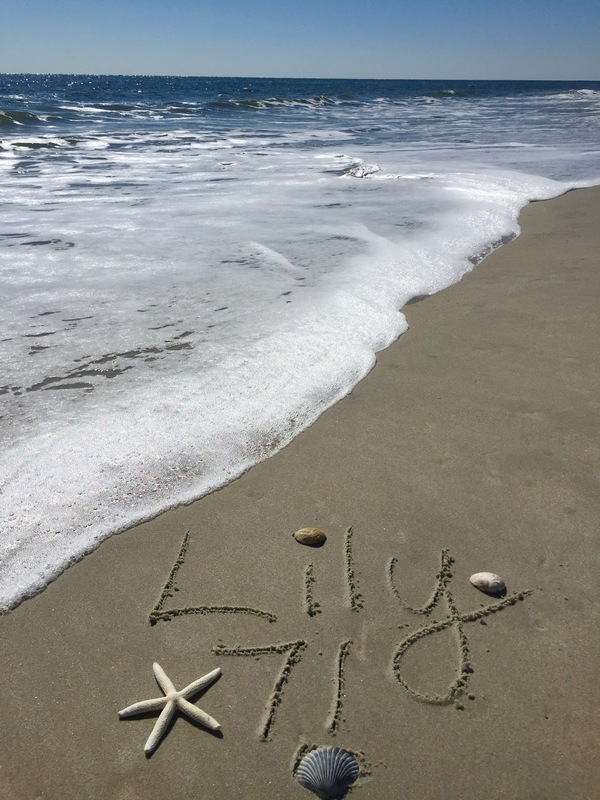 It was a gift to write Lily's name myself on the very Coast where she visited, on her birthday. 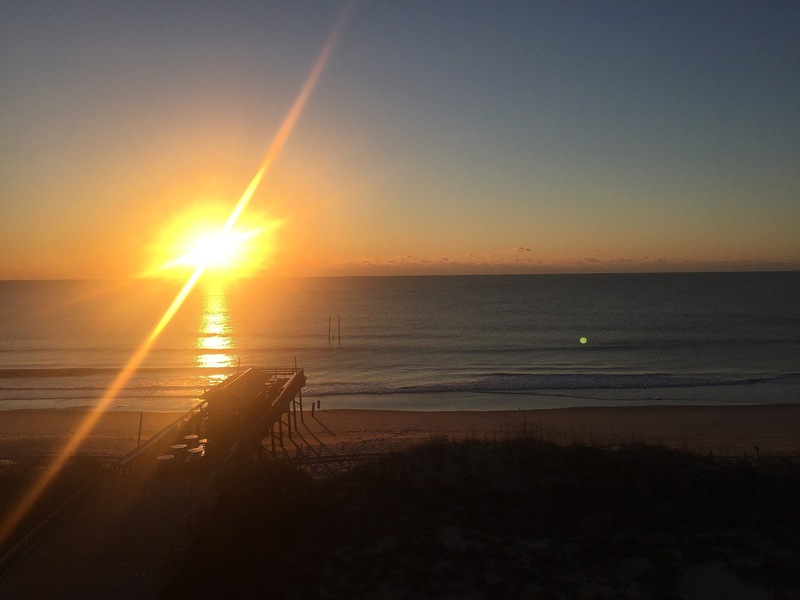 Daylight Savings was just a few days before, so I was thankful to have an extra hour of light. 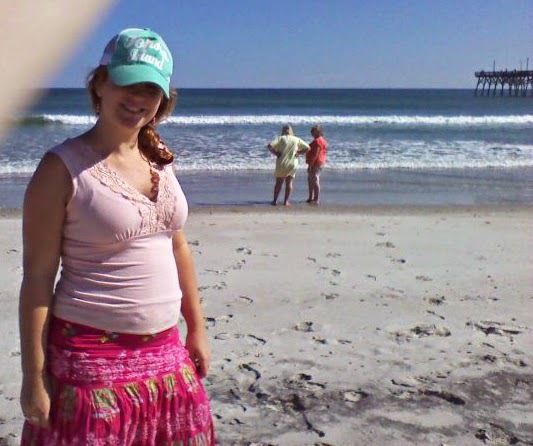 Here are Lily and I at the beach in October 2009. We hung out in the room the rest of the night, chatting, and watching more HGTV. 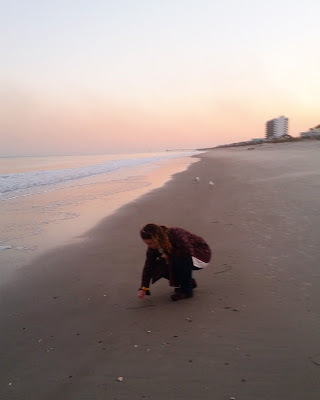 On Friday morning, St. Patrick's Day, I wrote a few more names in the sand and we said goodbye to the beach. We checked out and drove to Wilmington, which is on the way back home. 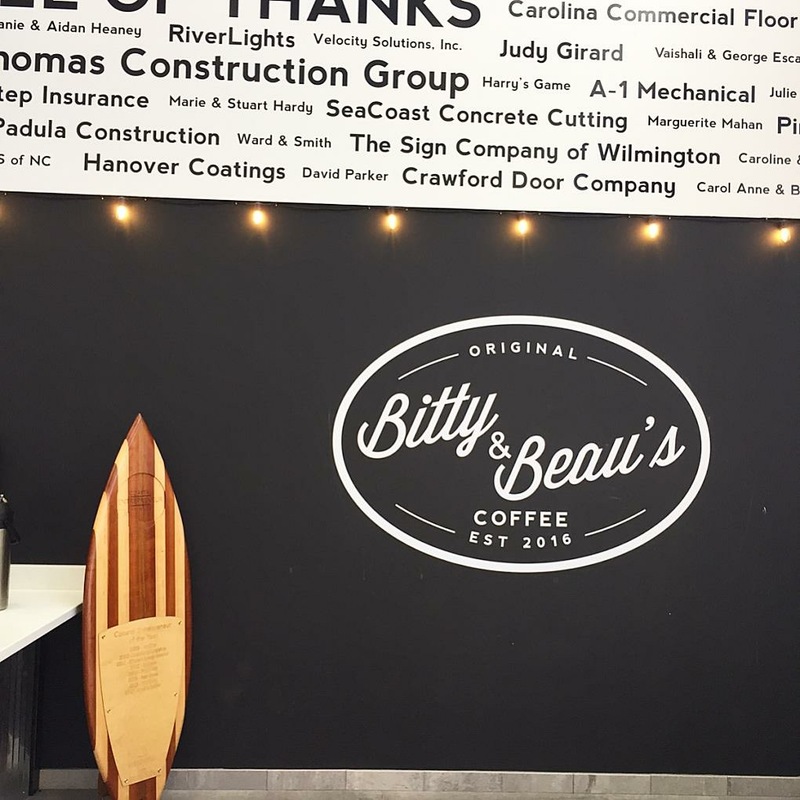 I wanted to make sure we went to Bitty & Beau's Coffee Shop. I first heard of it last year sometime when I saw a viral video about it on Facebook. About Bitty & Beau's: "70% of people with intellectual and developmental disabilities (IDD) are unemployed. 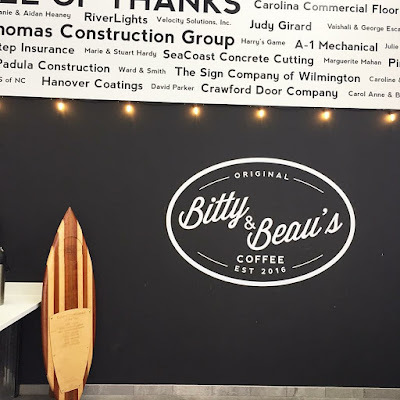 Bitty & Beau's Coffee strives to change that statistic by creating a path for them to become valued, accepted and included in every community. The original shop opened January 2016 in Wilmington, NC, and is run by 40 individuals with IDD." 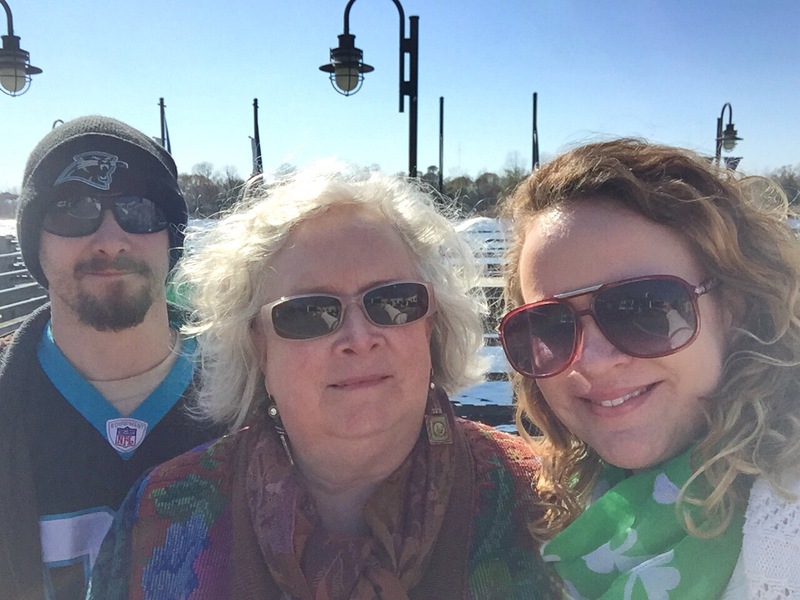 It's truly a special place and I loved going with my mom and brother on St. Patrick's Day with all the staff wearing flashy green things! 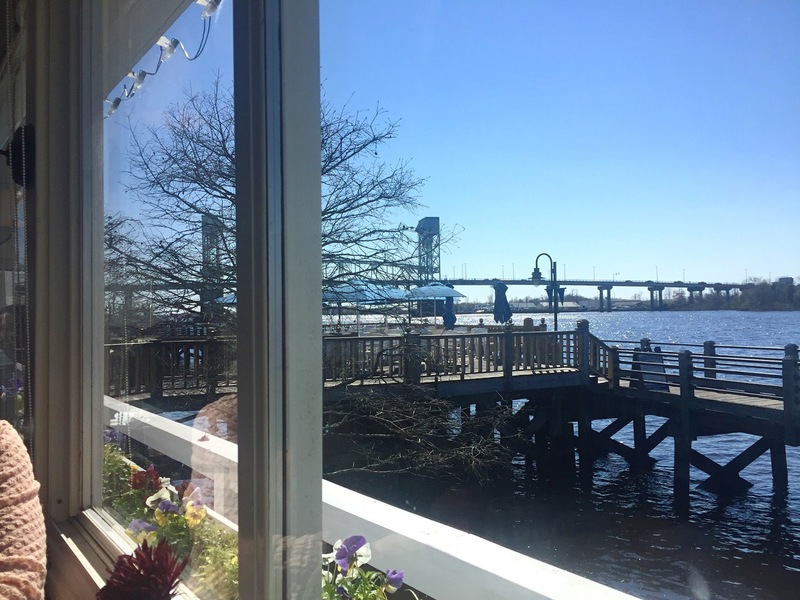 We then went downtown to the Riverwalk where we had lunch at a restaurant called The Pilot House, which one of the gals at the coffee shop recommended. We wanted to make sure we had seafood while we were in town! 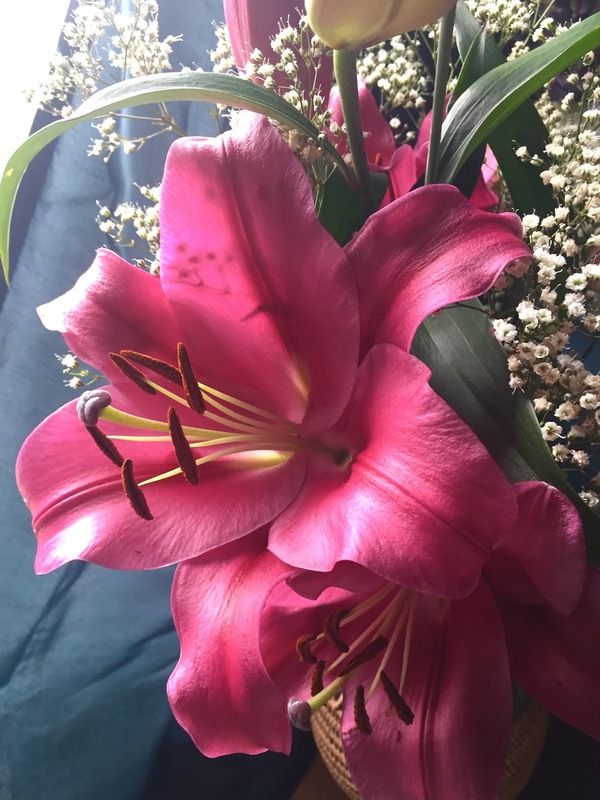 Each year for Lily's birthday, I've been blessed to receive flowers (roses and lilies of course) from friends and family. This was the first year I hadn't, which honestly made me a little sad. 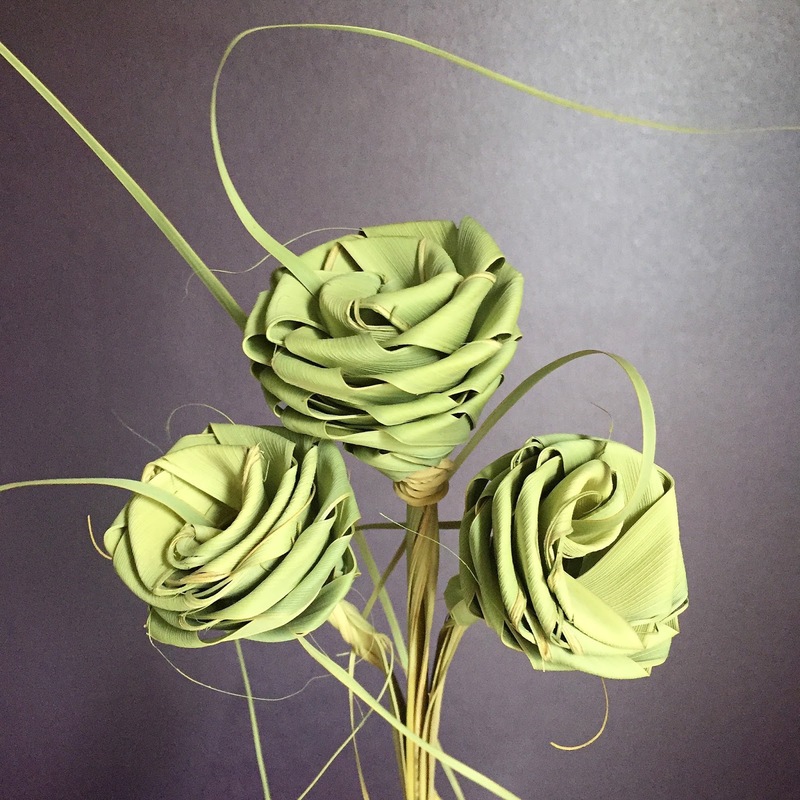 When we were strolling along the Riverwalk, we came upon a sweet older man sitting on a bench, making palmetto rose bouquets. 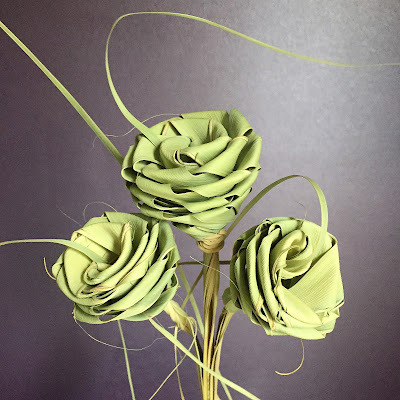 He demonstrated how he makes them and was interesting to talk with. Adam told me to choose which bouquet I liked best because he wanted to get one for me. I selected the one that our new friend called "the special St. Patrick's Day bouquet" (perfect for my mid-March girl). So I ended up getting flowers after all. :) And these are a forever kind that I can have on display on my desk for many coming years, reminding me of Lily and her special birthday trip. These flowers will never with away, which is perfectly reflective of my sweet little flower whose beauty and legacy also won't fade with time. I was rockin' my St. Patrick's Day green for my mid-March girl! 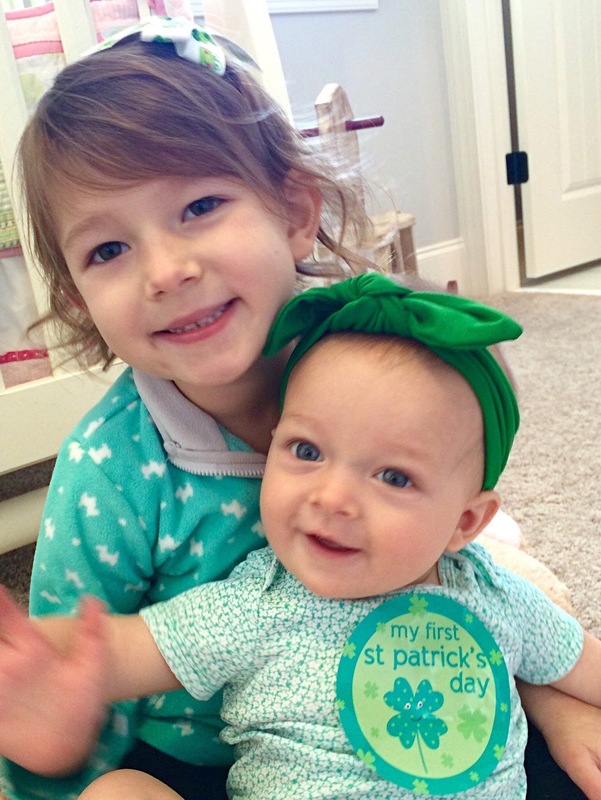 My friend Amanda sent me this darling photo of her girls on St. Patrick's Day and wrote: "Prayers to you today! 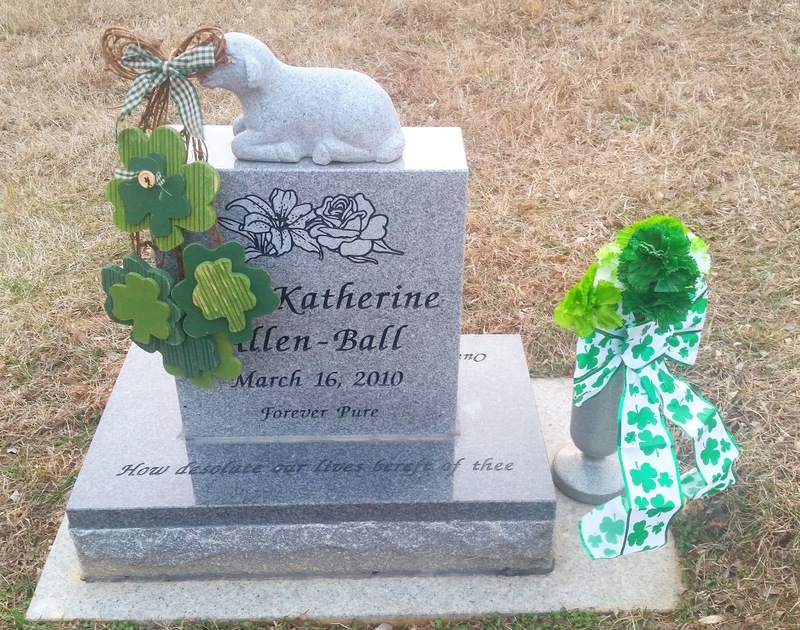 I never really thought much about St. Patrick's Day... rarely wore green. But today my family is rocking the color green! Gracelyn has on about every shade. 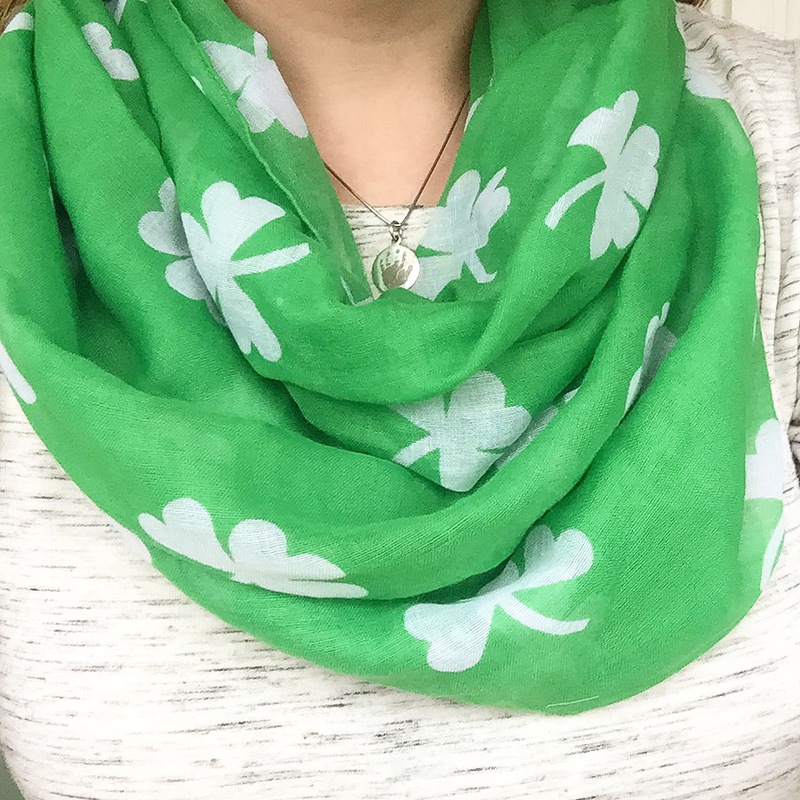 We wear green today for you, Hannah Rose! 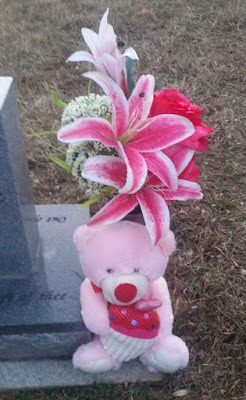 The day 7 years ago you had to leave the hospital without your baby girl. Thank you for your sharing your labor and delivery story with me the other day. We mourn with you today. BUT remember Jesus in all of today as well. Because He heals the brokenhearted. Romans 12:15"
Speaking of Amanda, she came over on Spud Day (Lily's due date - March 14th) to celebrate Lily's birthday with me! We had such a special time talking and she was asking questions about my birth experience and Lily. I was able to share my memory chest and scrapbook with her. And she brought me a present. 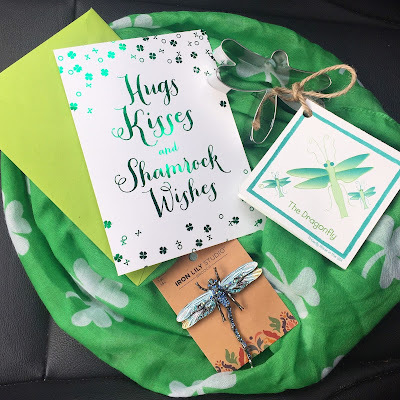 I got a Shamrock balloon for Lily's birthday! 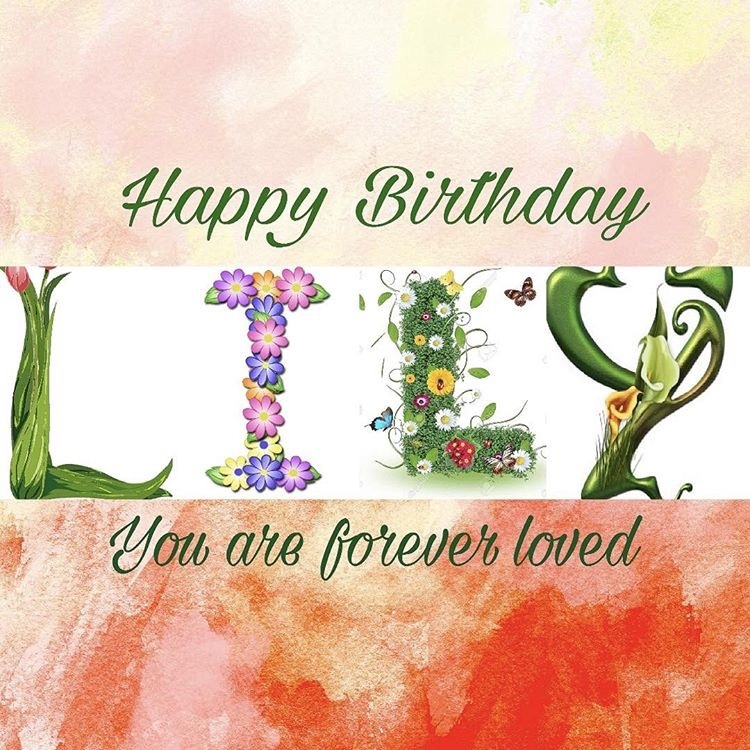 One of my favorite birthday traditions (let's be honest, all traditions are my favorite hehe) is having Lily's spot in Crozet, Virginia beautifully decorated, both for her and for any visitors she may receive on her day. I sent the items I selected (a bouquet of roses and lilies, a birthday teddy bear holding a cupcake, a number 7 birthday flag from Etsy, and a couple balloons) to my grandmother. 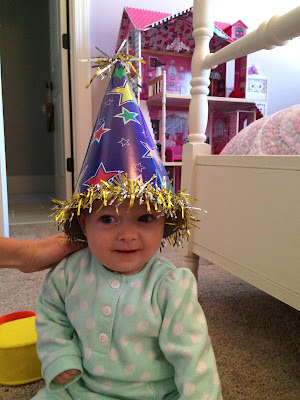 Thanks to she and my Aunt Sarah and Uncle Steve for decorating for me. 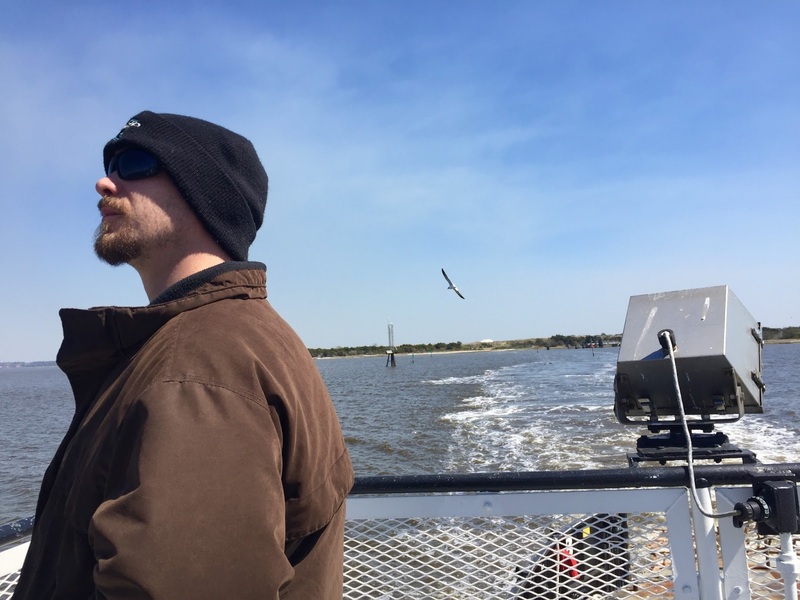 And thank you to my friend Elise for going by as well and snapping some photos for me. 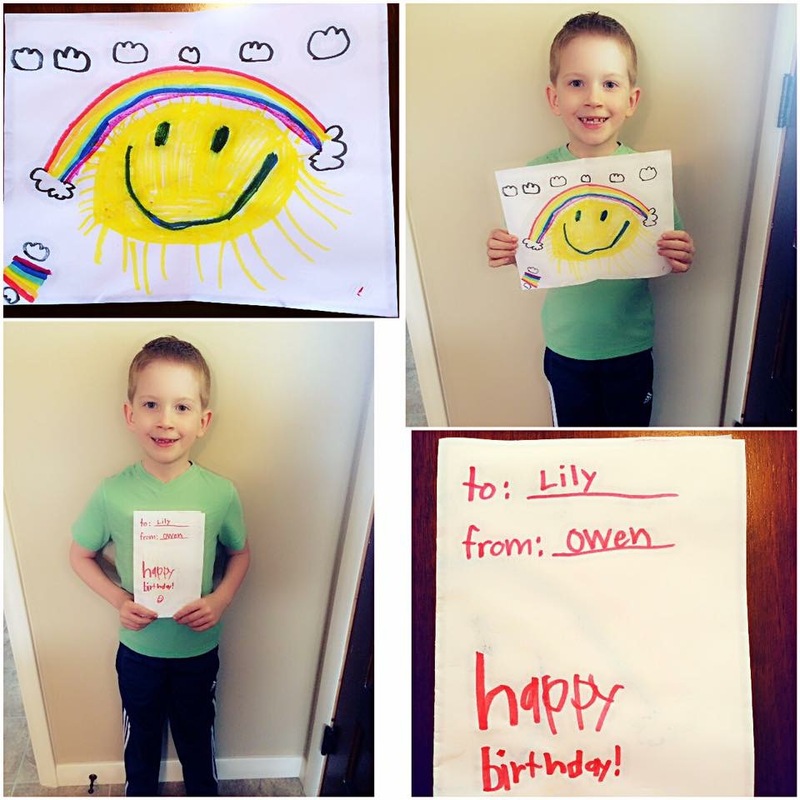 This is my cousin Daniel's son Owen wishing Lily a happy 7th birthday in Heaven! Daniel was born 4 months after me and Lily was born 3 months after Owen. 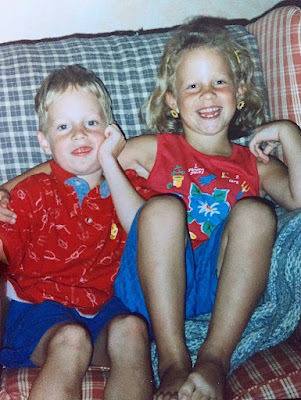 Boy and girl cousins almost the same age apart! Oh how I dreamed they'd grow up close buds like Daniel and I were. Each year on Lily's birthday, Owen takes a photo like this. 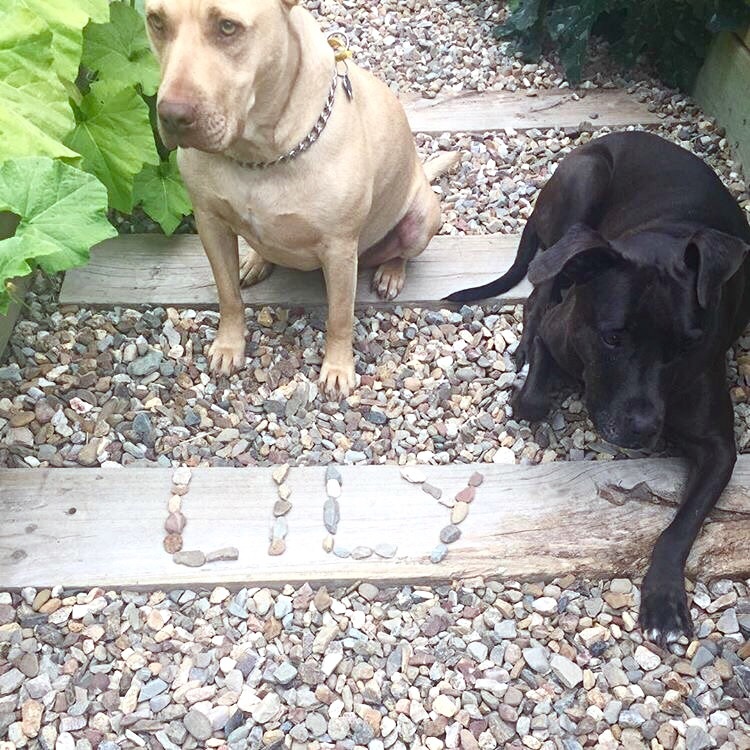 It is bittersweet to see him growing up through the years and to know Lily would be the same age, but she'll never grow up. 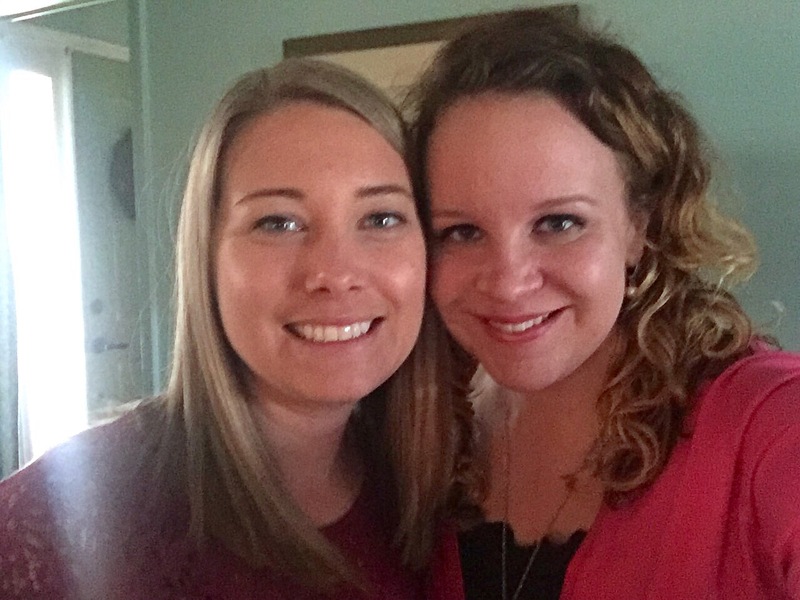 I am thankful for these - the only way they can be in photos "together." 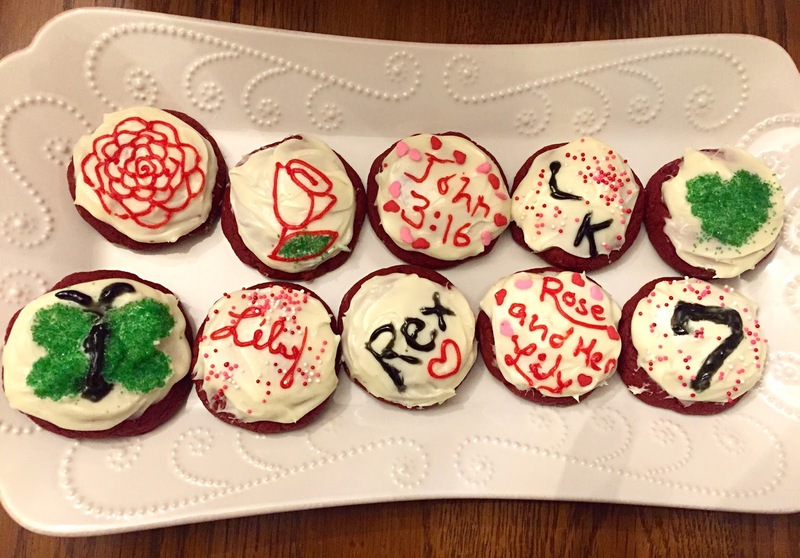 Owen's mom, Rachel, is so thoughtful and kind to remember to do this for me and Lily Kat. 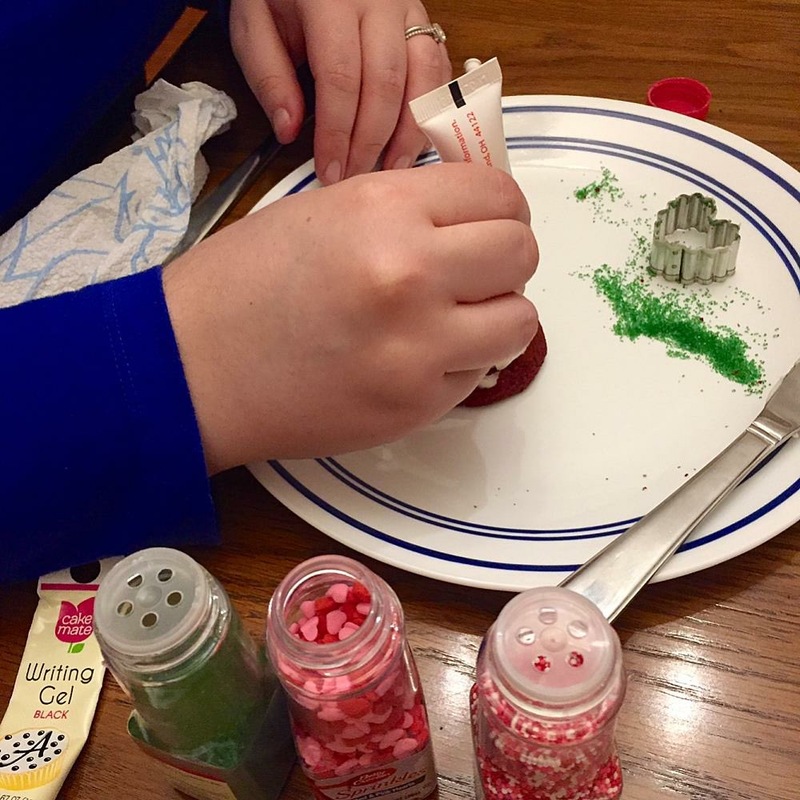 One of my favorite traditions! I hope Owen will want to continue doing it through the years. Isn't that rainbow bright and beautiful? And here's a picture of Daniel and I on my 7th birthday! 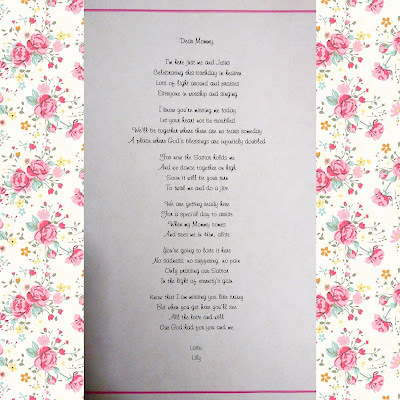 I love this poem and the way my Bumma loves my Lily! 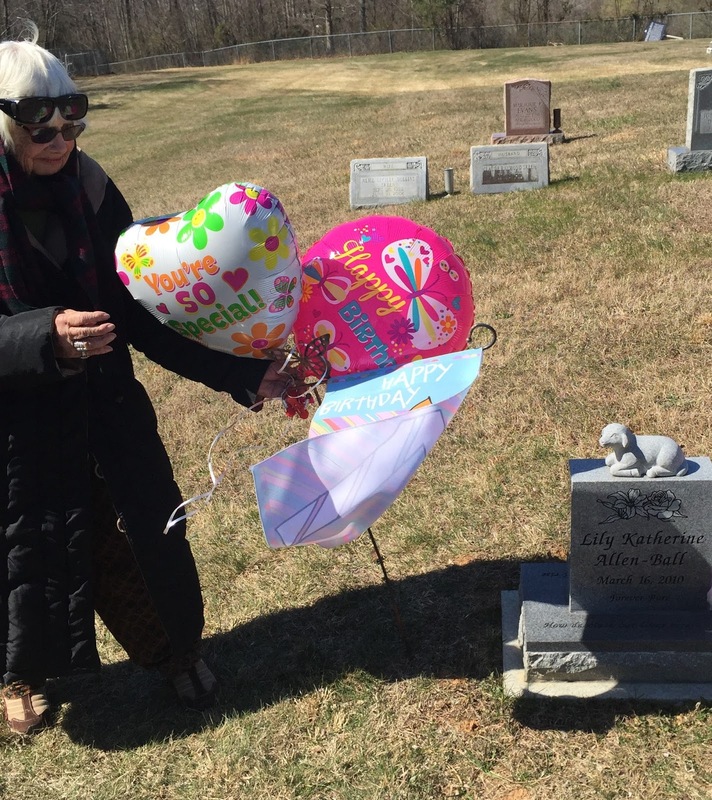 Our love for her spans generations and extends beyond the grave. I especially love the part that says "Heaven gave her breath!" 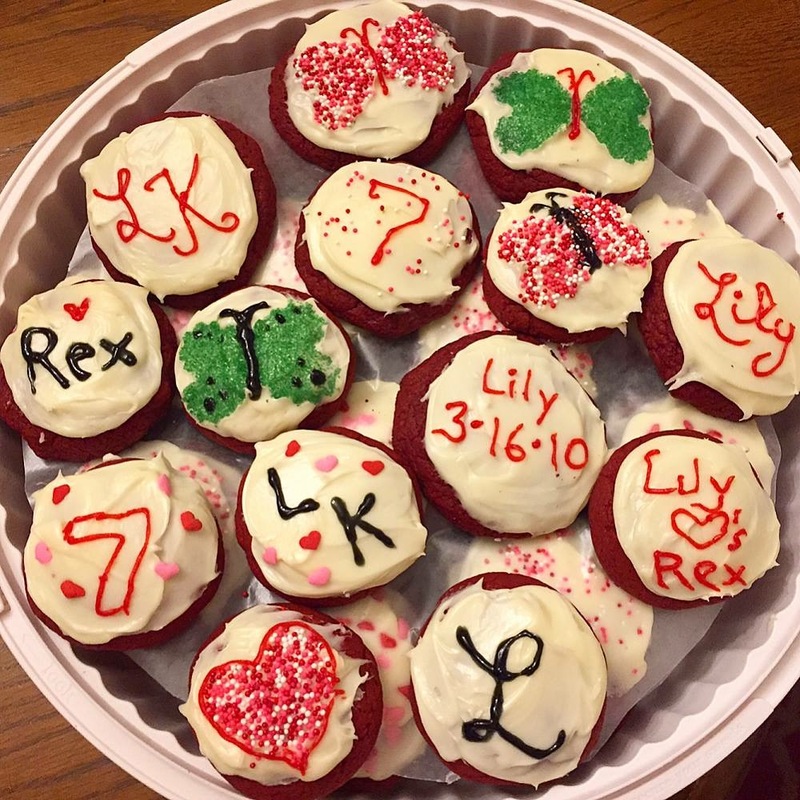 These are Lily's 7th birthday red-velvet cupcakes, made with love by her Auntie Kala! 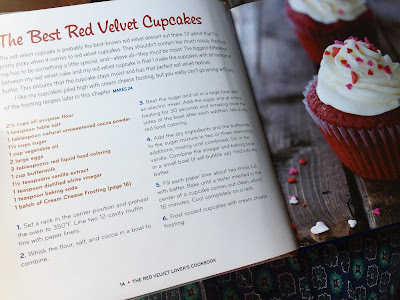 The recipe came out of the red-velvet cookbook that my friend Erin gave me for Lily's birthday last year. 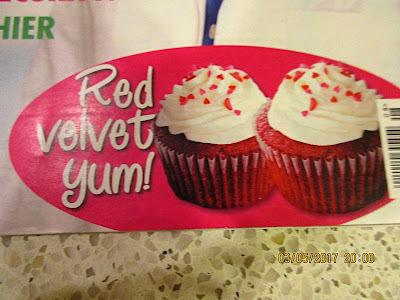 They were the best red-velvet anything I've had (especially the icing)! And I've had a lot over the past 7 years! The gold and pink butterfly and "7" cupcake toppers were from Etsy, with metallic gold wrappers. 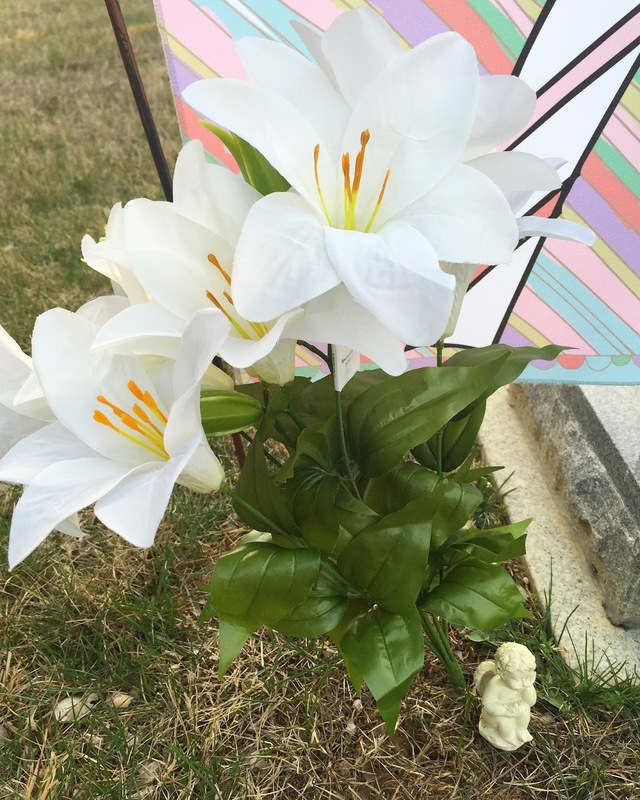 My friend Kristen visited Lily's spot for her birthday and took her some white Easter lilies and a tiny statue, which means so much to me! Kristen was one of my closest friends my junior year of high-school. It's pretty crazy all that we have in common now... 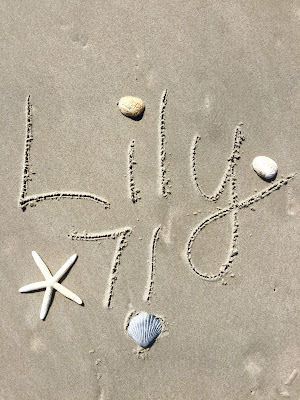 Her first child, a boy, was born on March 16, 2010 (Lily's exact birthday) and is a healthy 7-year-old now. As if that's not interesting enough that we birthed our babies on the same day, her second baby, a girl named Ryleigh Grace, was unexpectedly stillborn at 38 weeks gestation last August. 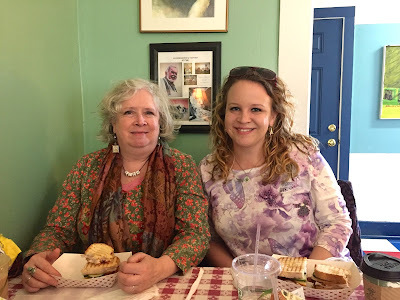 And I "just so happened" to be in town when her mom wrote me with the news. 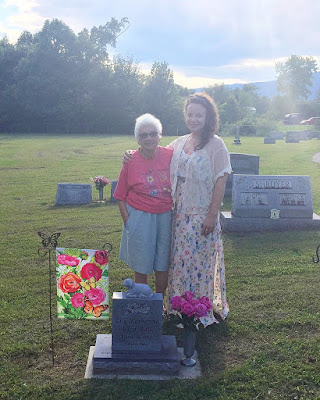 My grandmother and I were able to put together a comfort box for her and attend Ryleigh's beautiful Service. 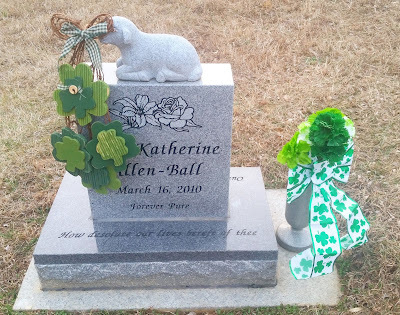 God is in the details and I'm thankful to have Kristen and her mom Susan as friends, to remember our baby girls together. Kristen also sent me this. 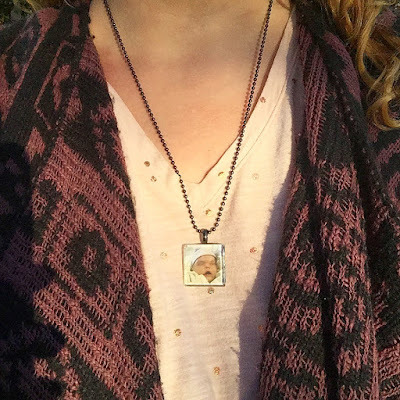 Susan sent me the sweetest package... a necklace with my favorite face on it... just like the necklace they have with Ryleigh's beautiful face on it! My friend Jennifer honored Lily for her birthday month by writing her name beautifully in the sand on vacation in Riviera Maya, Mexico! 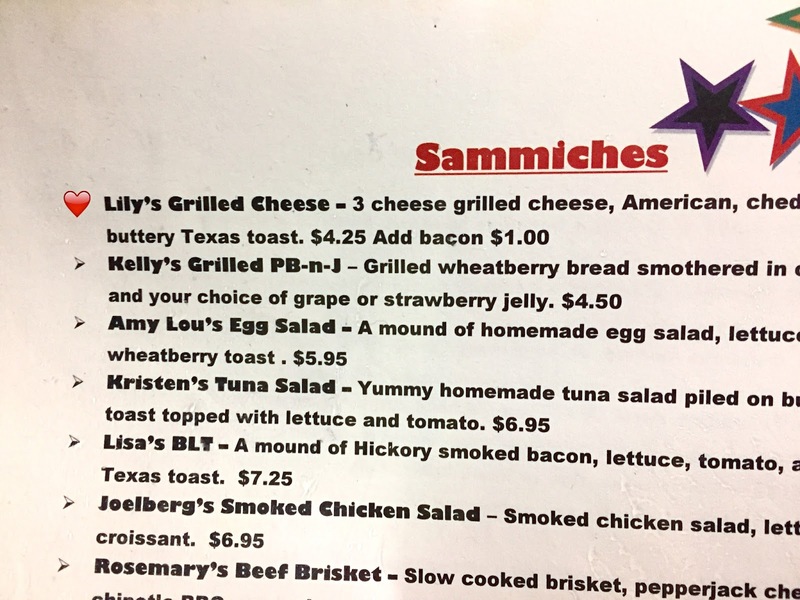 It was the first time it'd been written there. A new friend named Bianca in Durban, South Africa randomly stumbled upon my Instagram page and started following along. 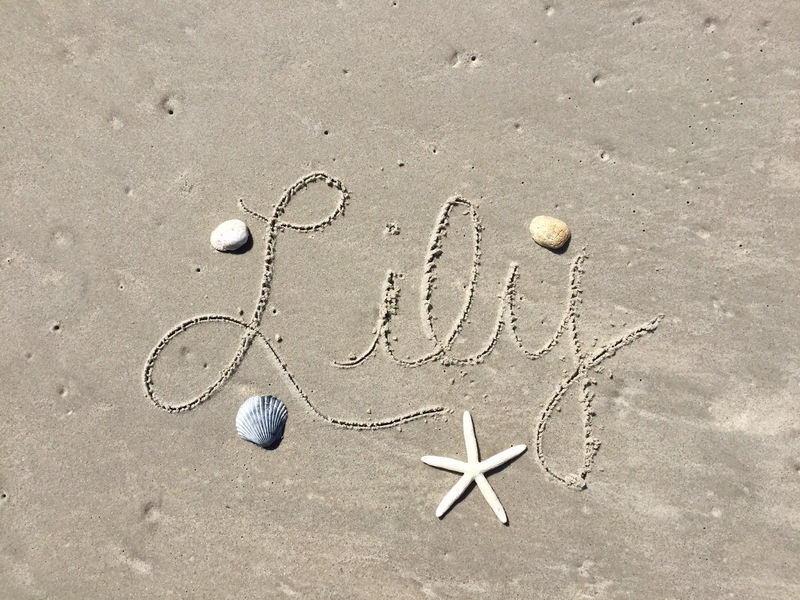 She said Lily's name caught her eye because her own daughter is also named Lily. Her Lily was actually born on what was Lily Katherine's due date (2 days before her birthday). 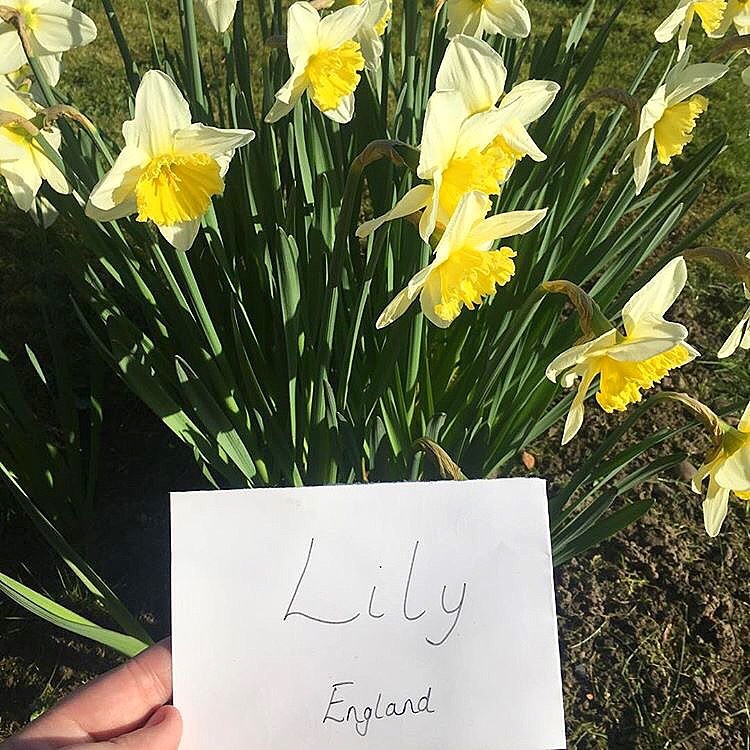 How special that a little girl across the world with the same name and a shared special date remembered Lily for her birthday! 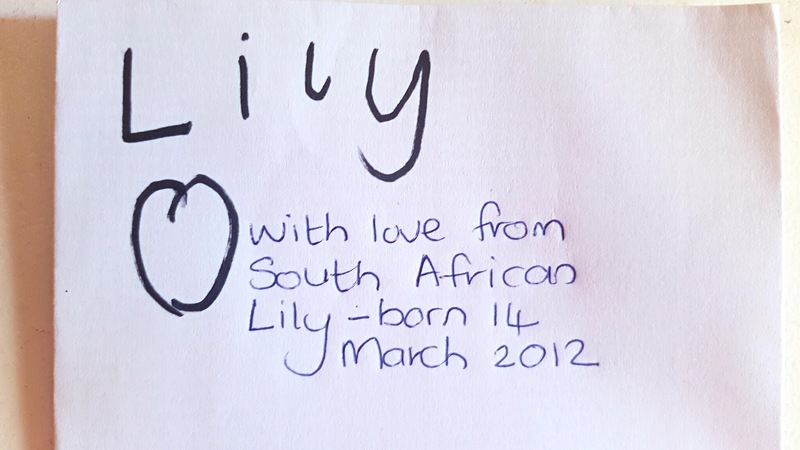 People around the world with all different accents were singing the "Happy Birthday" song to Lily on her special day! Bianca also sent me this video of Lily-Grace singing! 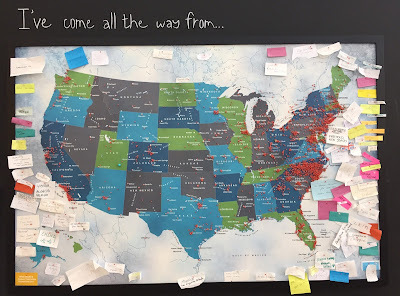 the internet affords the amazing opportunity of connecting with others across the globe. 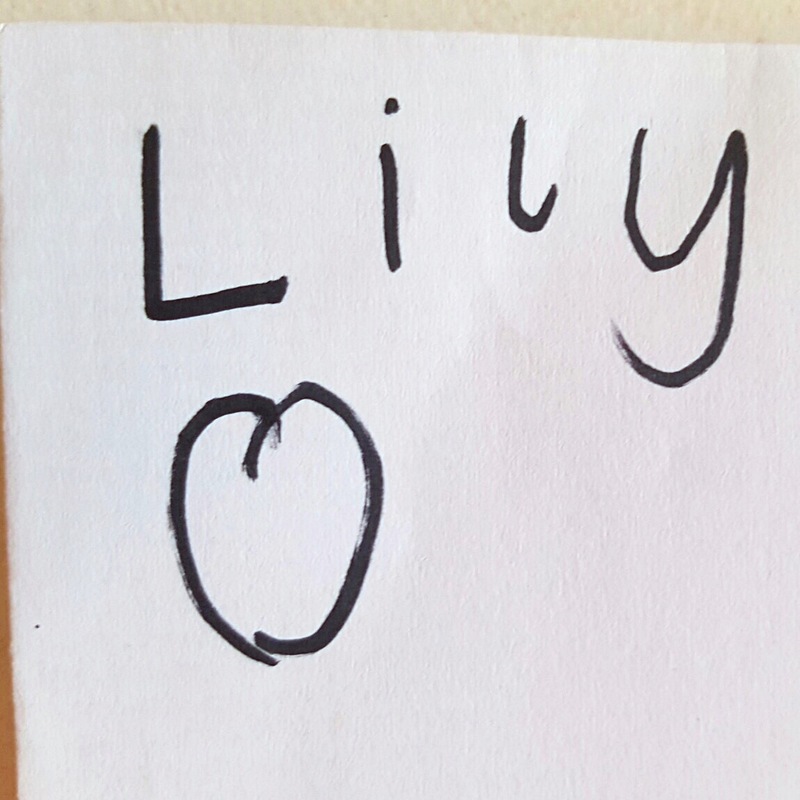 Bianca wrote the cutest message: "Lily-Grace was so impressed that Lily Katherine was 7 and said wow that's so big!" 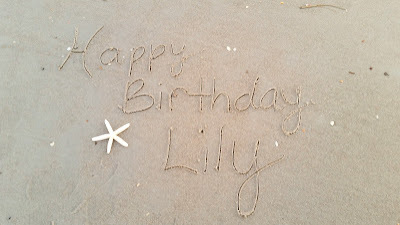 :) I love to see other kiddos celebrating Lily's birthday! 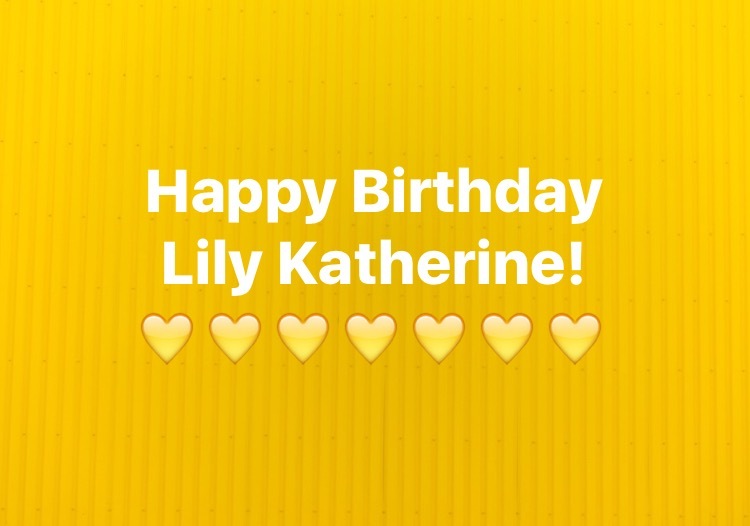 When I said how people with all different accents around the world were singing Lily "Happy Birthday," I meant it! Above I posted my friend's daughter from South Africa, and now here is another friend's daughter from the South. ;) Two little girls with such different accents that warmed my heart with their sweetness. 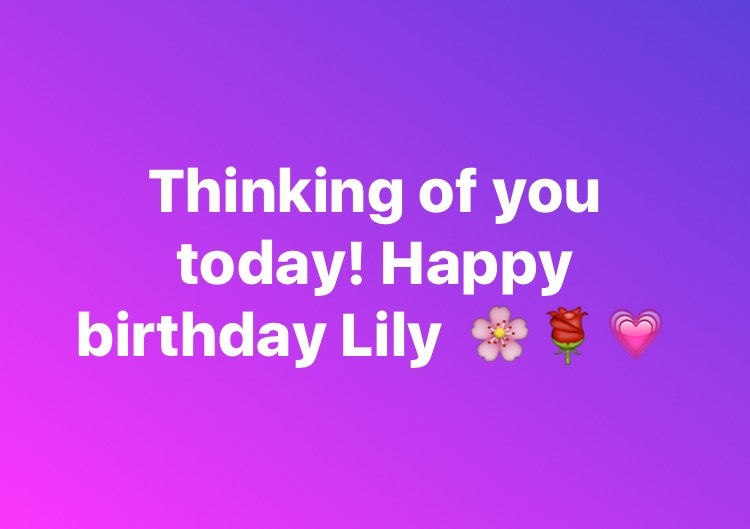 My friend Amanda (who I mentioned earlier) shared this video and photos of her girls with me on Lily's birthday and wrote: "Celebrating one special birthday today! 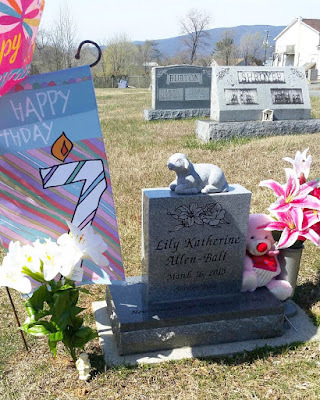 Happy 7th Heavenly Birthday, Lily! 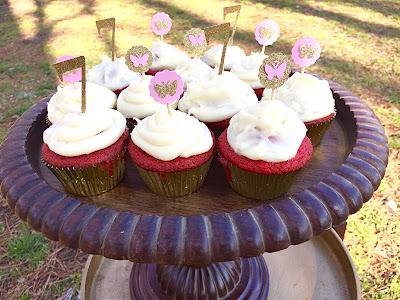 Imaginary rainbow cupcakes, songs, and dressed for a princess. 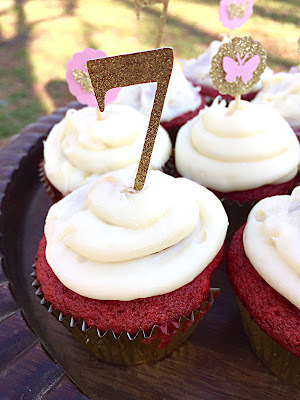 🎉 😇 🌸 🎁 👑 🎂 💗 7⃣"
So sweet! 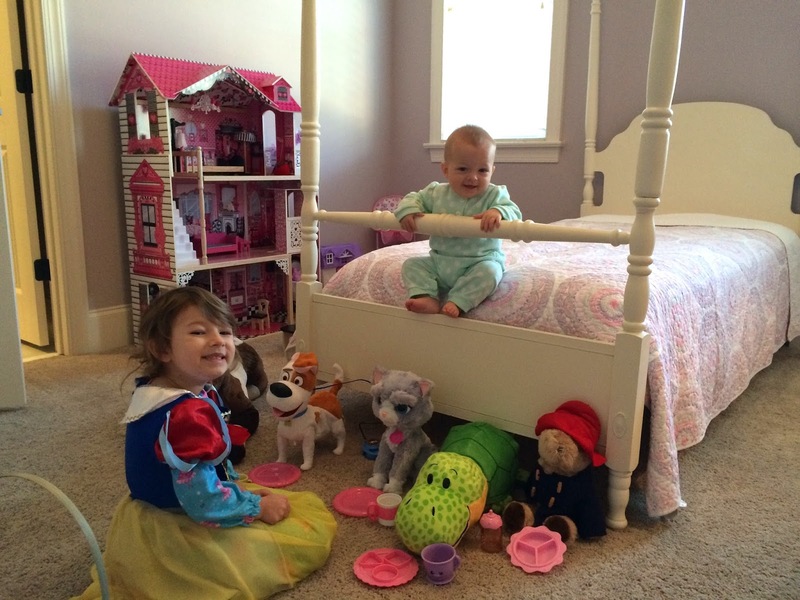 4-year-old Gracelyn and I have a sweet friendship between us. She made me a similar video a couple years ago on Lily's birthday. 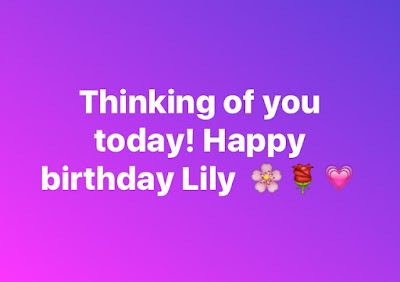 She sent me some beautiful emojis on Lily's birthday because that is "how she texts" (she said to her mom "how about I sent a lily"). She likes the silly Snapchat videos I send her. She wanted to see Lily's photo and asked if she could come to "Lily's birthday party" when Amanda came over on Spud Day. 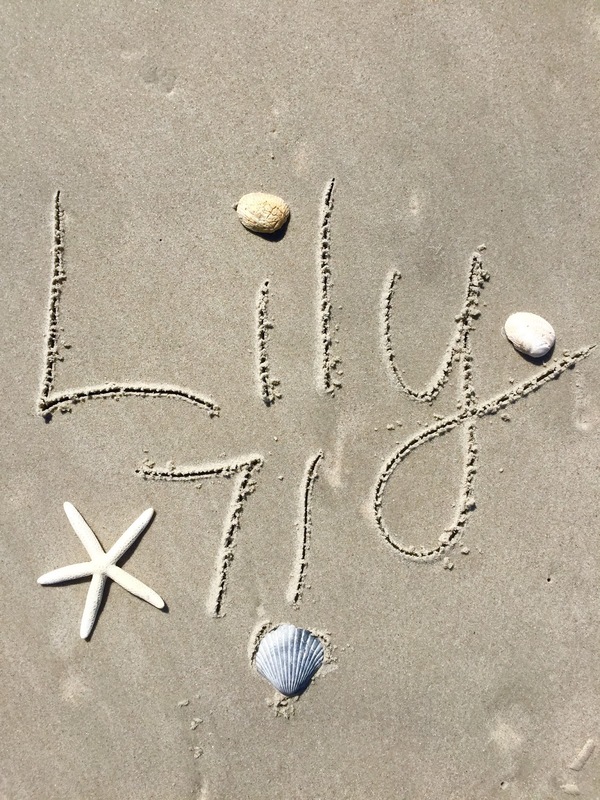 Friends who share about Lily with their children are amazing, and help teach me how I'll once day navigate telling my nieces/nephews/future children about her. 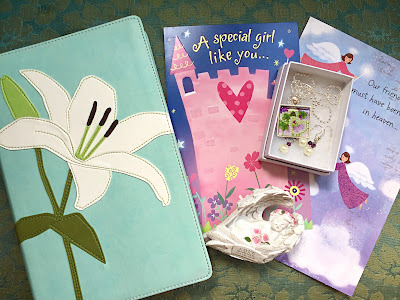 BreAnna in Utah sent me a couple beautiful things for my baby girl's birthday! 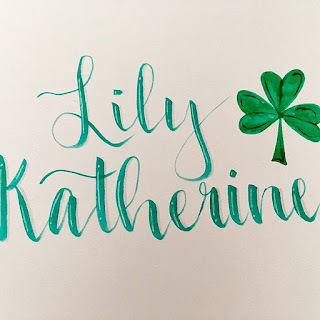 A gorgeous whimsical watercolor keepsake based on my favorite photo of Lily and I, and a St. Patrick's Day themed piece for my mid-March girl. 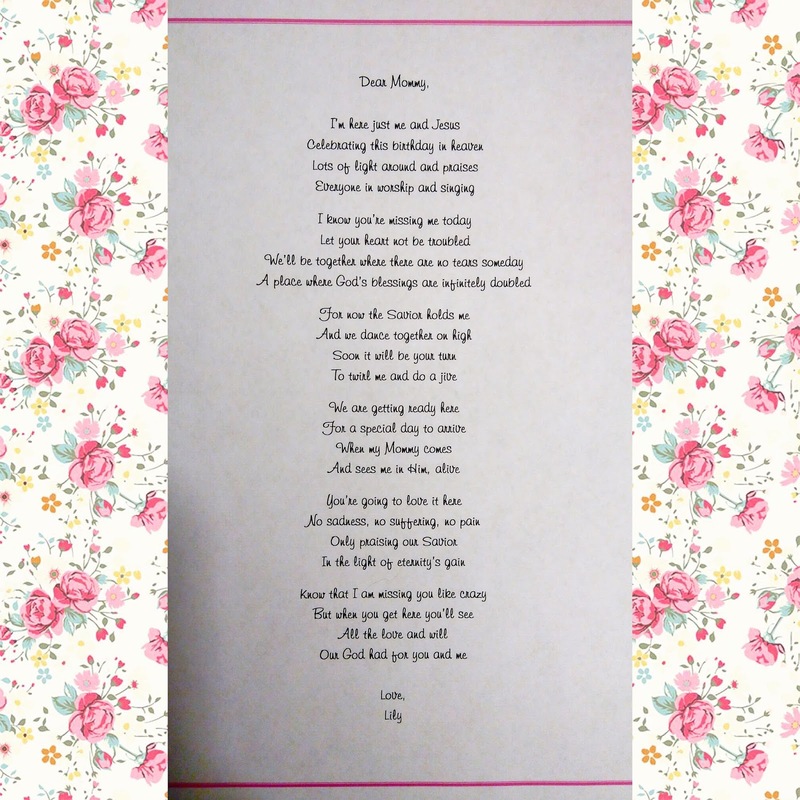 She is learning to hand letter to help her through her own grieving process. 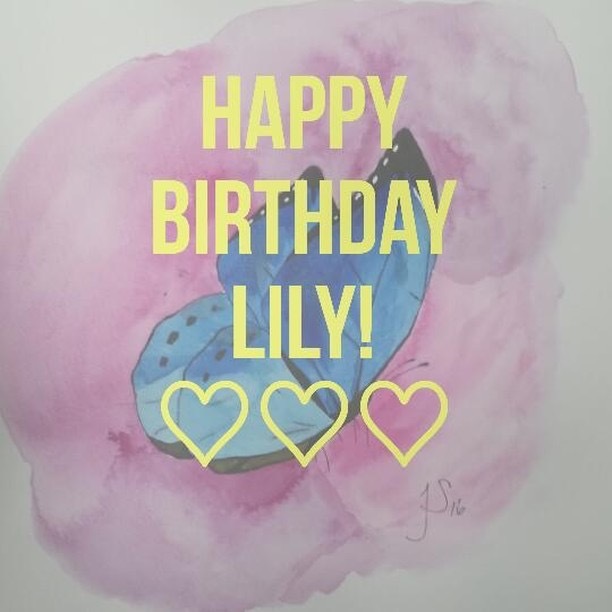 This gorgeous painting is from Mia for Lily's birthday! 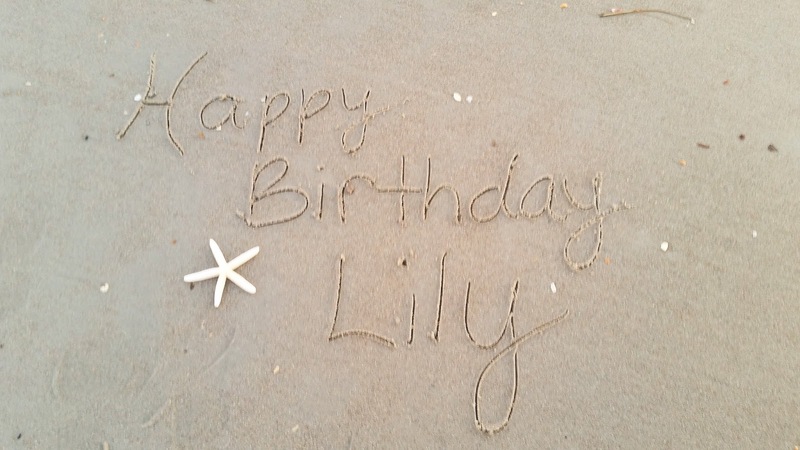 She wrote the sweetest message along with it: "Sending birthday love up to Heaven for your sweet Lily's 7th birthday. While I painted this lily I prayed for the Lord's constant comfort to surround you and for His continued blessings on your life. 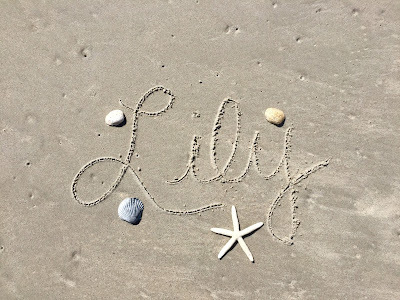 Lily is incredibly precious and will never ever be forgotten." 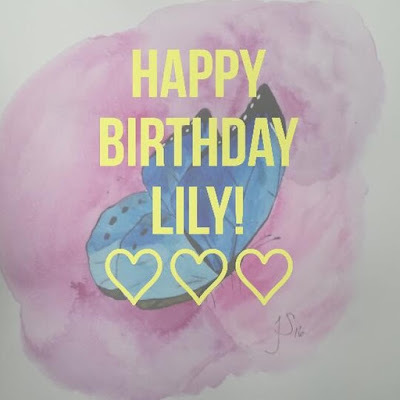 My dear friend Chloé in New Zealand (who drew Lily's gorgeous portrait), sent me this amazingly thoughtful creation for Lily's birthday. 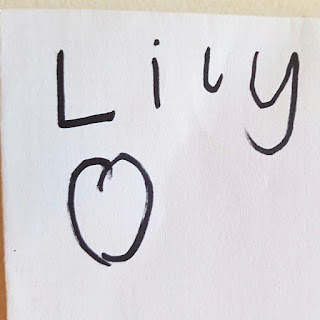 She used words I've shared about Lily to write her name. I love it! 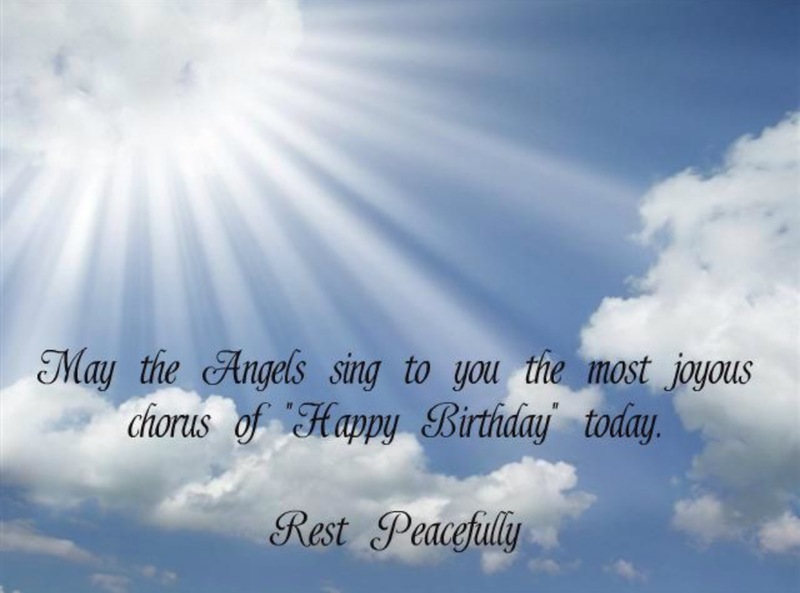 My friend Tiffany who lives on the opposite Coast also has a daughter who was stillborn on March 16th. This year was the decade milestone since Genesis was born. 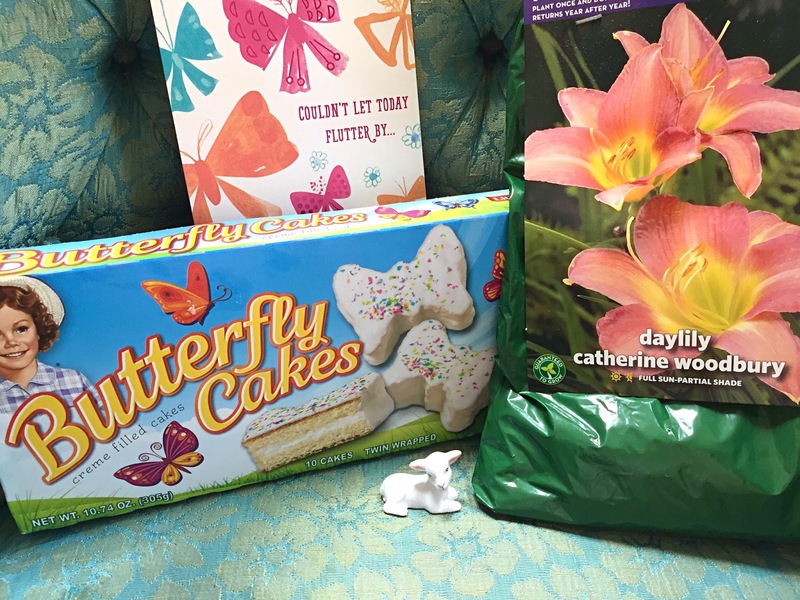 Sending a package in honor of her girl who shared my girl's birthday is something I treasure. Genesis has her own special spot in my heart. It is interesting reading what Tiffany writes because there are so many similarities between us... the same anticipation about our daughter's impending birthdays when the new year rolls around. The same tie we have to March 17th, St. Patrick's Day, and how we associate that date and all things green/Clovers/Shamrocks with our girls. Anytime I see dragonflies, something that makes Tiffany think of Genesis, it also makes me think of her. So I got her a Shamrock scarf (I got the same one for me too hehe), a dragonfly broach (with Lily's name on it, which is perfect since our girl's brought us together), and a dragonfly cookie cutter, so her other kiddos can do something in honor of their big sister. It's amazing how we carry the babies of our friends with us always. We both also like to snap photos of the things that are "winks from Heaven." Each year on March 16th, I like to see how Tiffany honors Genesis. We both have traditions. It is sweet thinking of them throughout the day, knowing that Tiffany is probably feeling many of the things I am at the same time I am. My friend Joanna is also my neighbor who lives just a couple houses down. The fact that we live so close and that we are friends makes it even more "ironic" that her daughter Ashley was also born on March 16th. She turned 14 this year, which means Lily was born on her 7th birthday. 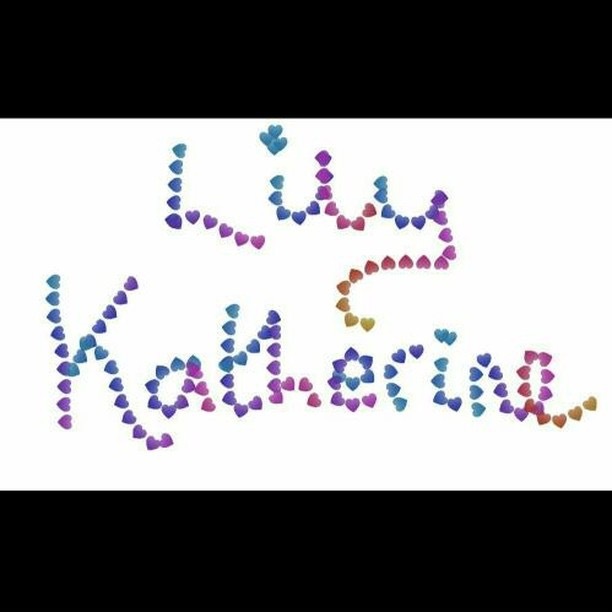 And now Lily should be that same age. My mom and I didn't know them well when Lily was born. However, it's crazy to think about how we were living by each other and had no idea that on the idea I was at the hospital delivering Lily, they were celebrating Ashley's birthday. Two little girls born at the same hospital on the same date 7 years apart. 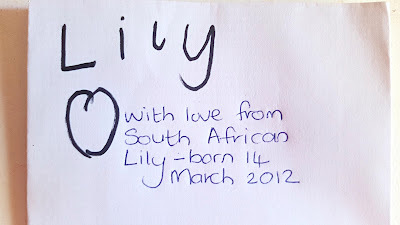 We discovered this shared date a year later, when Lily would have turned 1. It came up in casual conversation with my mom one day. That was around the time we started becoming friends with Joanna. We decided to take Ashley a gift to honor Lily on her birthday, since we can't get anything for our own little girl. They didn't even know about Lily at that point, but right when we took the gift over, Joanna was surprised we remembered her birthday and said, "Oh, you must have someone in your family with that birthday." So my mom told her about our girl. 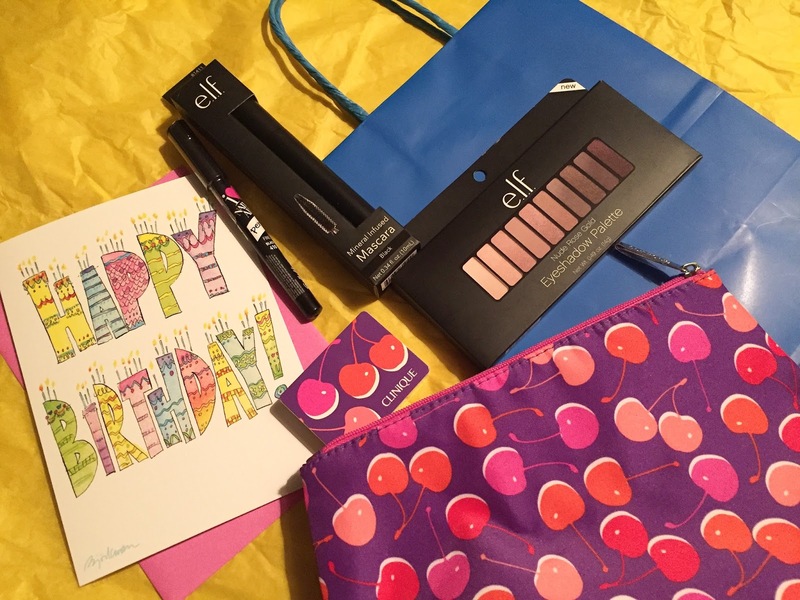 She was so sweet about it and wrote in a thank you card: "Ashley has really enjoyed her birthday gifts. 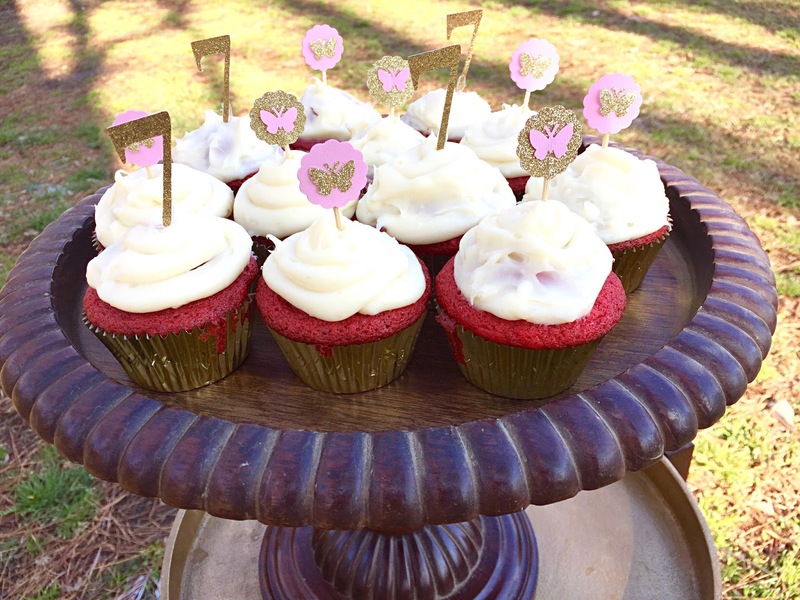 I'm glad she could bring happiness to your special day." (I am referencing old blog posts to recall these details). 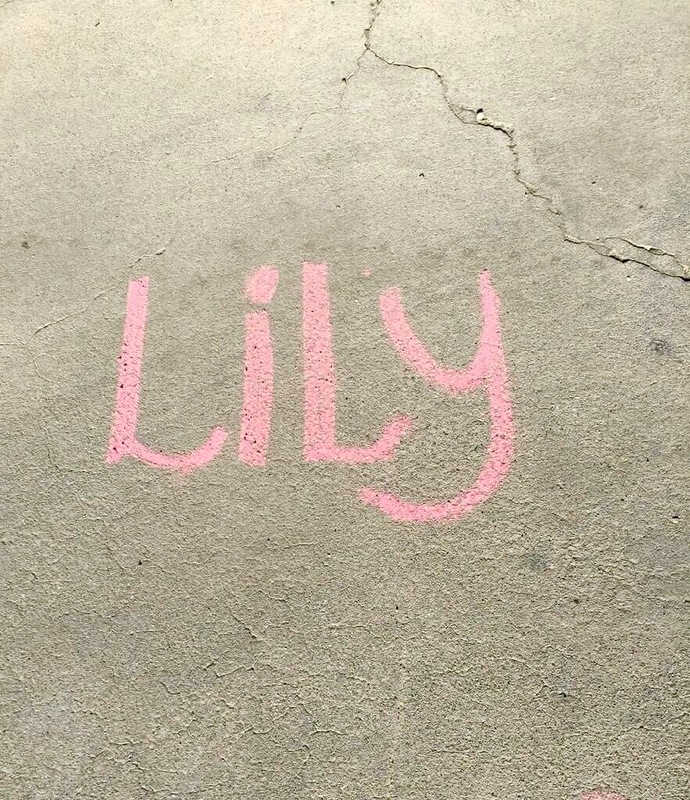 After that first year giving Ashley a gift, we decided to make it an annual tradition to honor Lily. And by that point, we had become good friends with Jojo. Not only is doing this for Ashley a sweet way to honor Lily, but we really enjoy shopping for girls and imagining what Lily might have liked through the years. We love watching Ashley open her gifts and it means a lot when she likes what was selected for her. 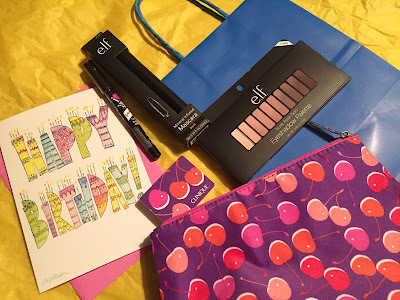 What 14-year-old girl doesn't like makeup? Joanna was so sweet... when we went over to their house, she made peanut butter cookies in the shapes of our initials, with a butterfly for Lily. She noticed my handprint necklace. And she reminded Ashley when she was opening her gift that March 16th is a special date for me too. Natalie in the U.K. thoughtfully lit a candle in honor of Lily for her birthday. 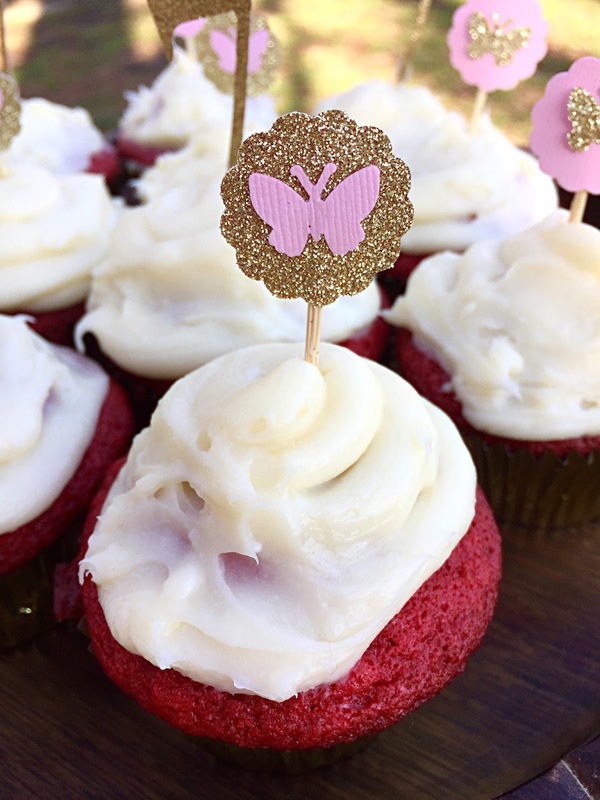 My adorable niece Harvest and sister-in-law Kala wore butterflies for Lily's birthday! Kala called it her "March 16 shirt." My dear friend Heather in Colorado, who wrote Lily's song 3 years ago, sent me these beautiful lily earrings and a thoughtful note. 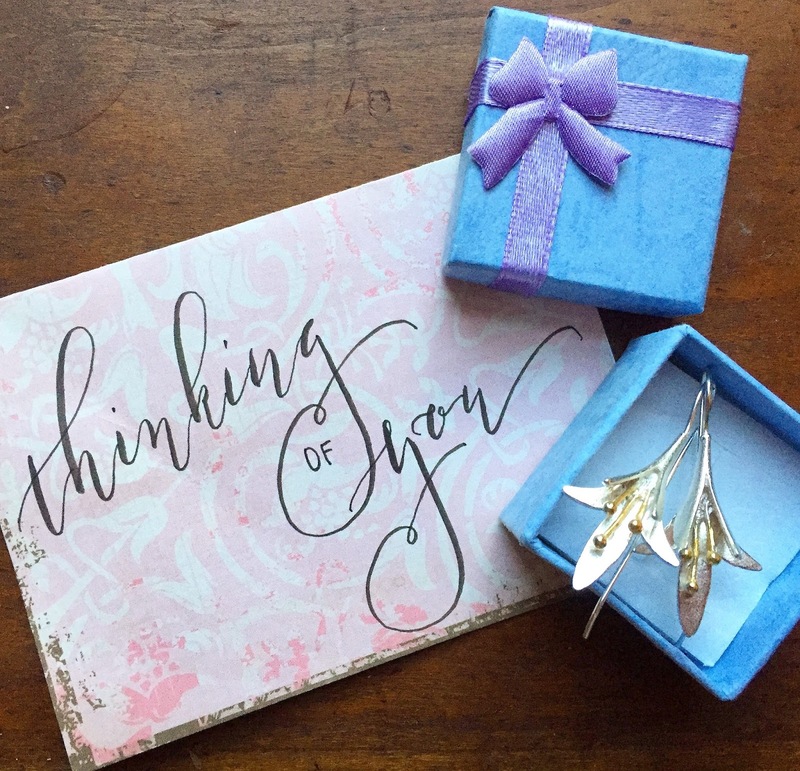 I loved wearing the earrings on Lily's day and have been wearing them nearly every day since I opened them. I absolutely love them! 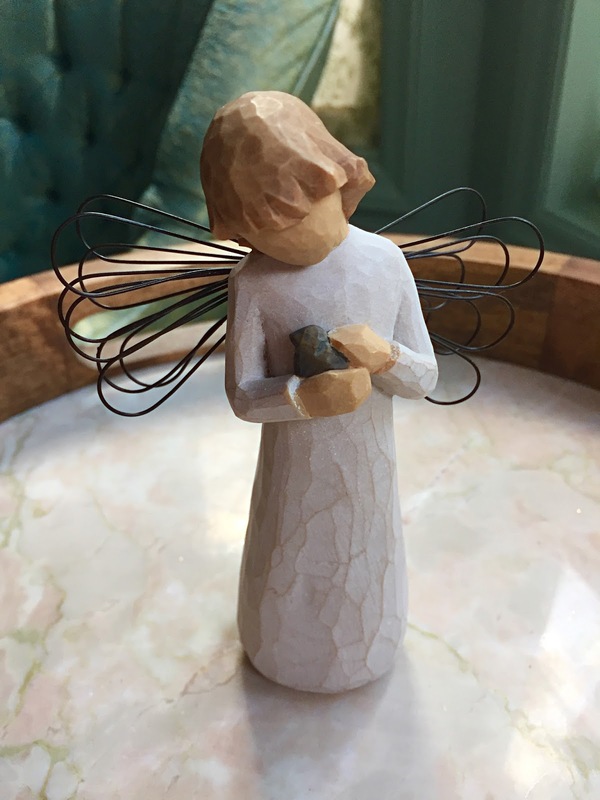 Another gift I opened on Lily's birthday morning was a Willow Tree to add to my growing collection, from my friend Stacy in New Hampshire! :) It's called "Angel of Healing." 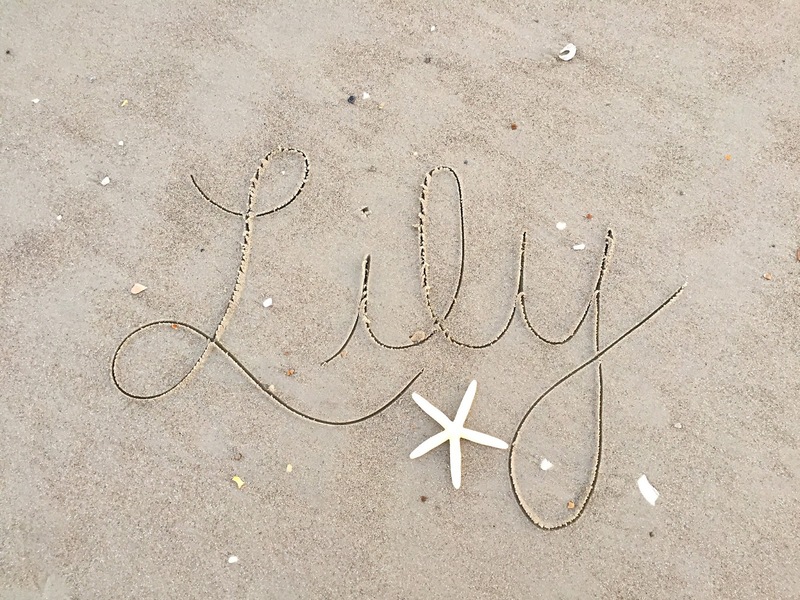 She wrote: "This reminds me of your love for Lily - how you kept her safe and protected her. It reminds me of all the little ones that Lily's life is touching thru you as you honor her by ministering to others. You mother her so well. 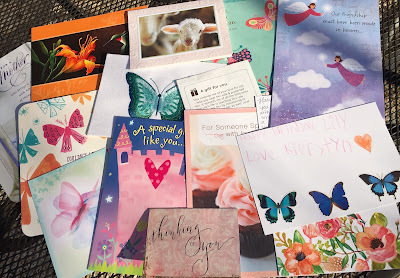 Love and Hope, Stacy"
I so appreciate each and every card and note that was sent/given for Lily's birthday. 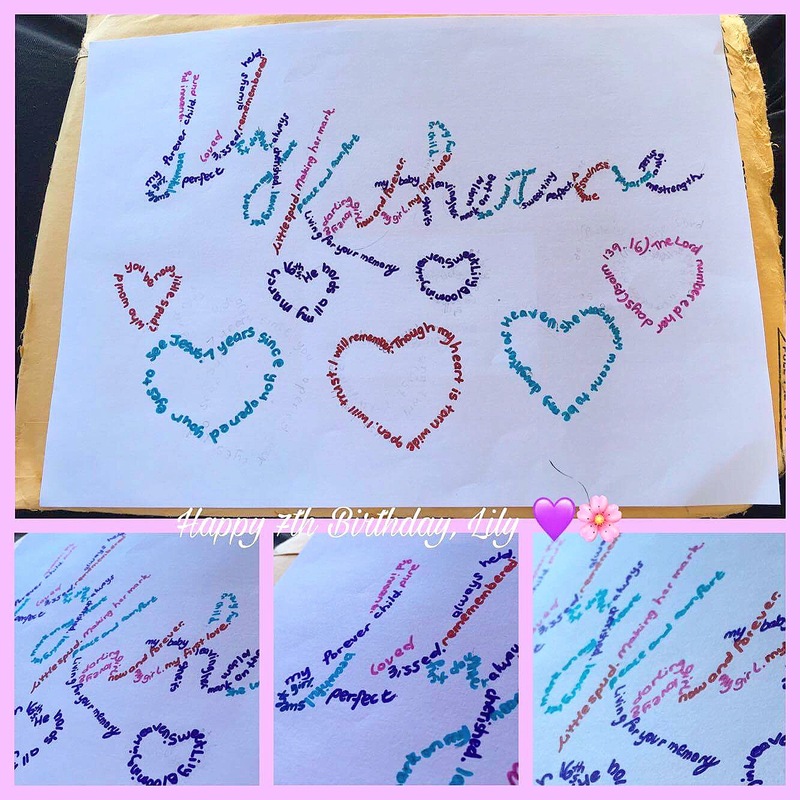 Each one will be kept always in my memory chest that holds the cards, letters, and notes I've received over the years pertaining to Lily Kat. Even the comments, texts, and emails I've received are so precious to my heart that I'm planning on printing them out to save. Each of these cards has reminders of Lily written all over them... lambs, butterflies, lilies, red-velvet, and princess related. There is something extra special and sweet about receiving birthday cards addressed *to* the birthday girl. 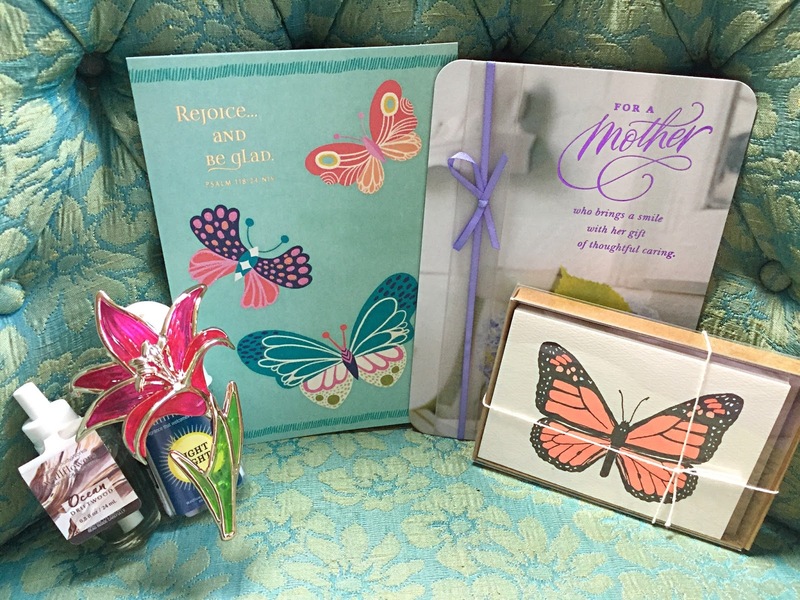 See that card on the right with kiddo handwriting? That one is from my friend Brianna's sister. She wrote: "It's March now, and the trees are budding, and I'm finding myself thinking of your sweet Lily very often. My sister is 7 too. She's just starting to be able to read well on her own, and is very much into American Girl, art projects, and kittens these days. 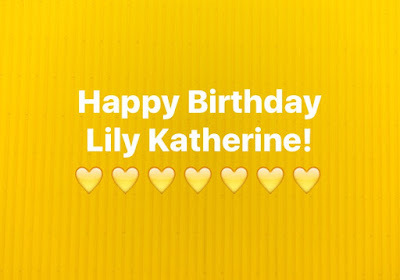 I like to think that she and Lily would be friends, and we both want to wish her a happy birthday." ... These are the things that melt my heart. 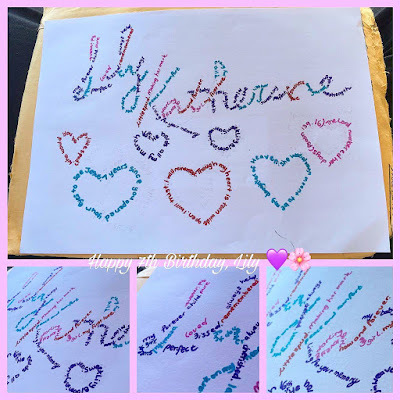 My sweet friend Anna made this for Lily Katherine's birthday and wrote to me on the Eve of her special day: "I know it's a day early, but I wanted to make sure you had this for Lily's birthday. 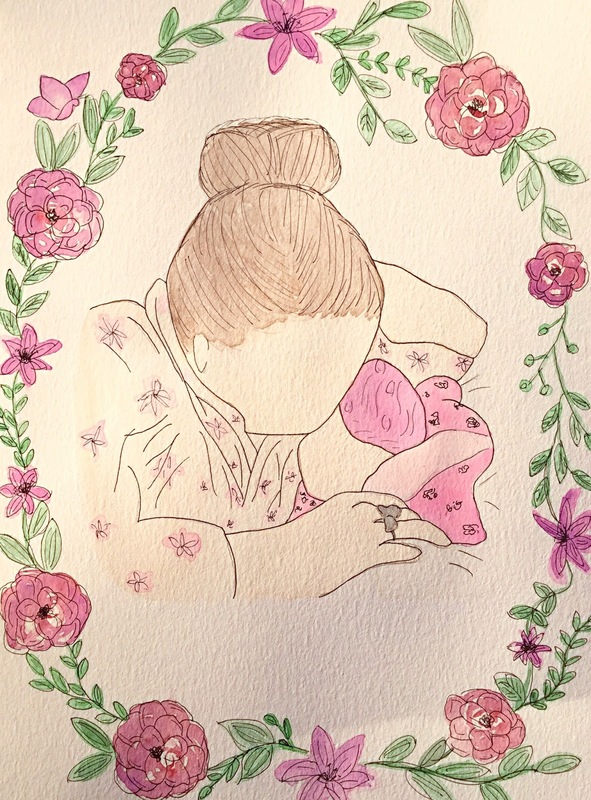 I was thinking about her the entire time I made it, and I hope it brings you some comfort. 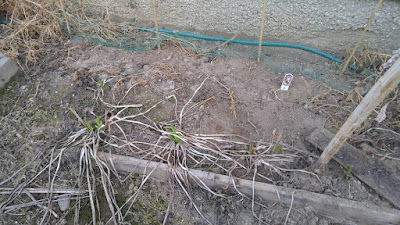 I'll put a tea light in it tomorrow evening, and light it in her memory. Sending lots of prayers and hugs. 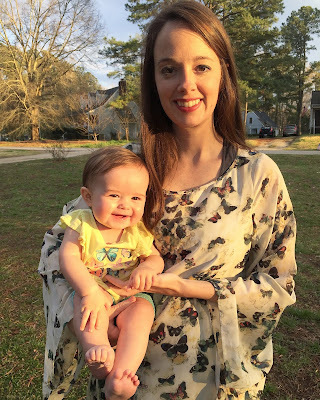 You're an amazing mom to this sweet girl." Rosie's mummy in Rotherham, England sent me this with the daffodils in her garden on Lily's birthday. 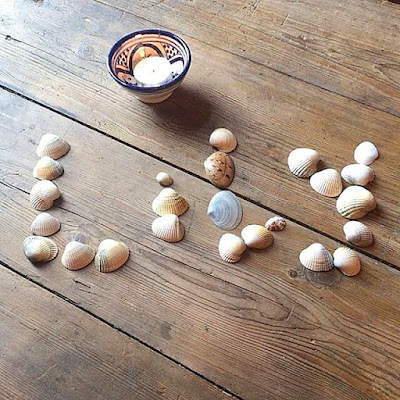 Claire in the U.K. sent me this photo of Lily's name written with shells Claire picked up on the beach in Agadir, Morocco, and a candle lit in L.K. 's honor. 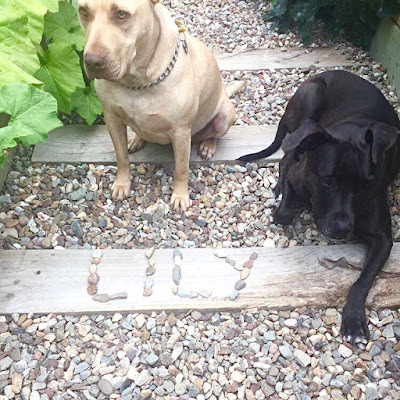 Andrea in Canberra, Australia remembered Lily for her birthday, along with her cute doggies hehe. 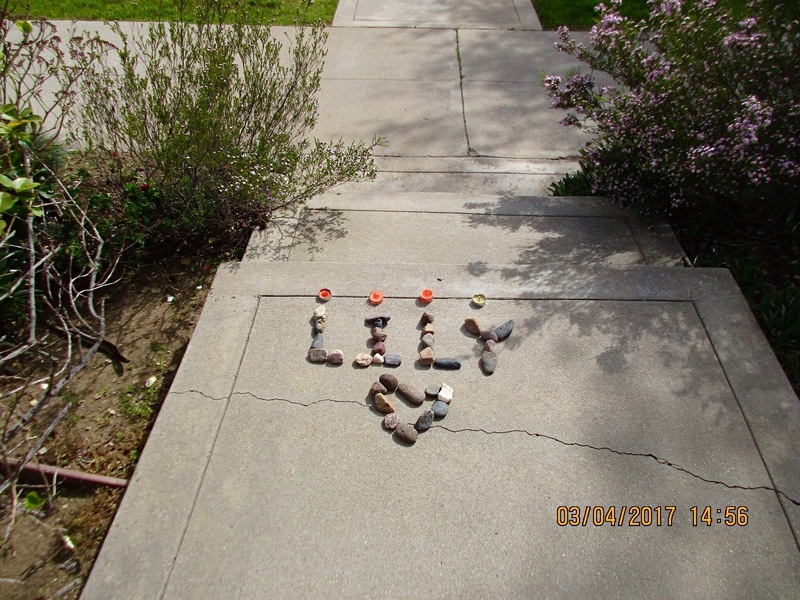 Jessica in Orangeville, Pennsylvania remembered Lily for her birthday. 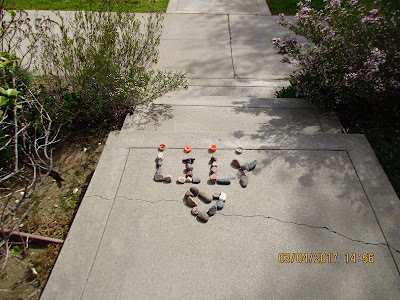 Susi in California sent me this and wrote: "The four candles were symbolic of several things: 1) the letters in Luke's name, because I rarely think of her, without thinking of him. 2) because candles are lit in memory 3) despite the great tragedy of her passing, you are bringing light to the world (so inspiring!) 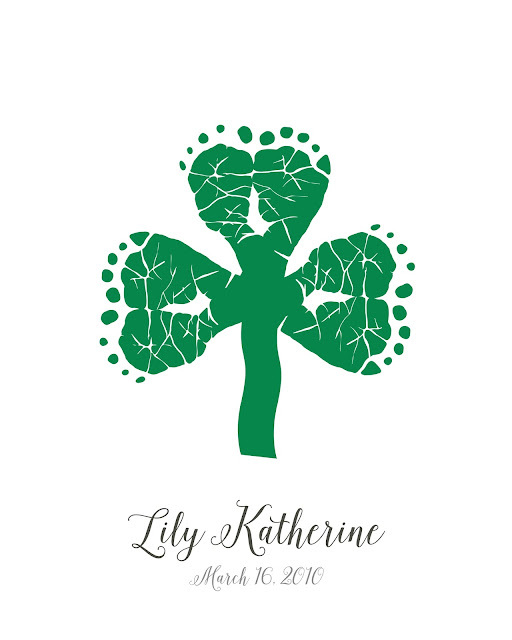 4) they represent the words "in loving memory of." May this bring some comfort and healing to you. Thanks for all you do. Hugs and prayers." 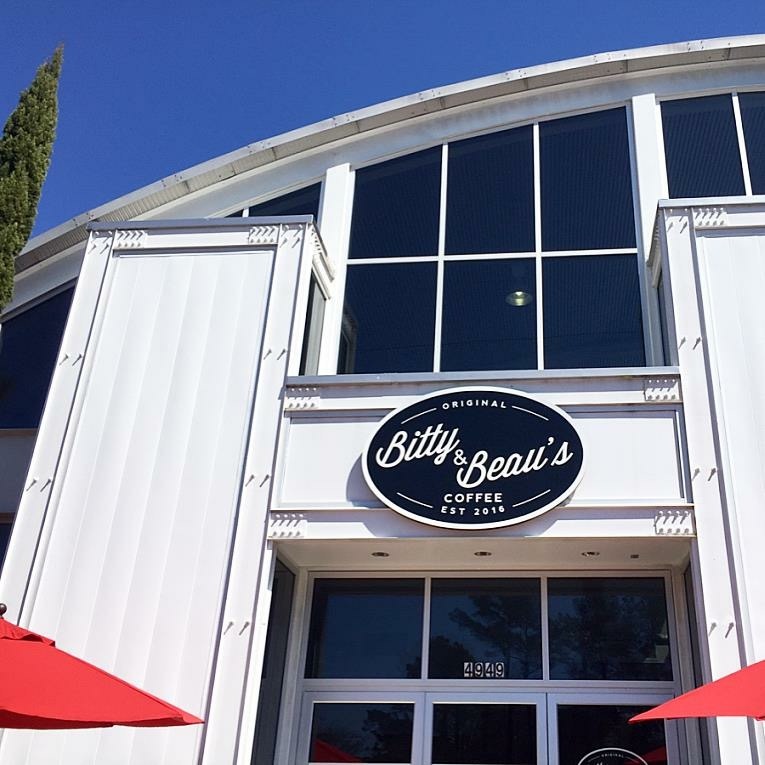 Susi in California also sent me this: "Hi. 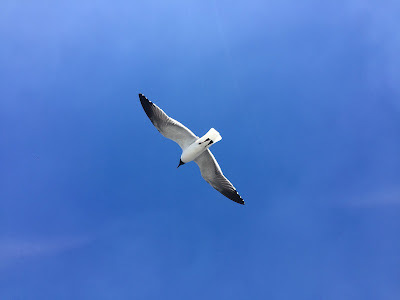 Here is another pic I took for you today. This was on a magazine on the counter that happened to catch my eye." 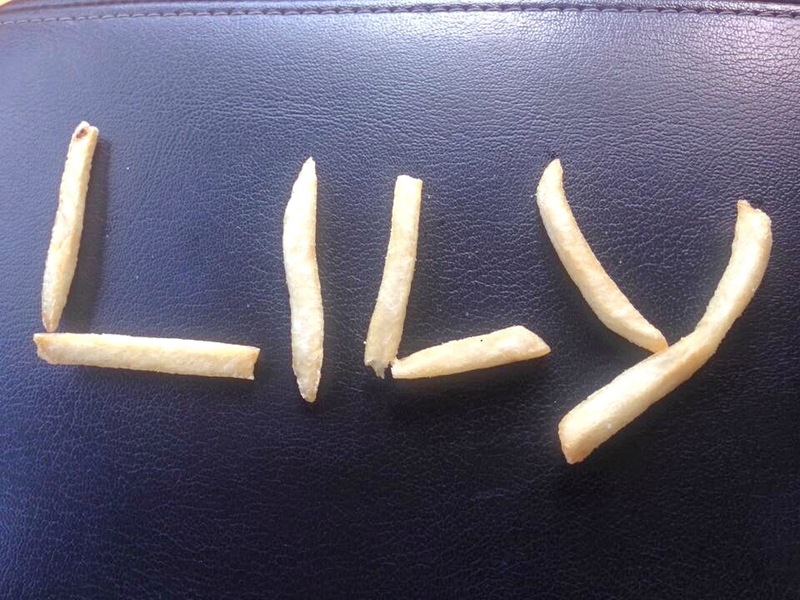 My friend Niki sent me this photo with the sweetest words: "Ok I may look really silly for doing this, but all month I have been praying and secretly asking God for a creative way to write out Lily's name for her birthday month and today while my kids were eating fast food I thought, oh my goodness I know exactly what I wanted to do. So with significant unhealthy choice today for a quick meal I thought of all of the happy meals you didn't get to buy her and all of the toys you haven't had to sneak to the trash can! 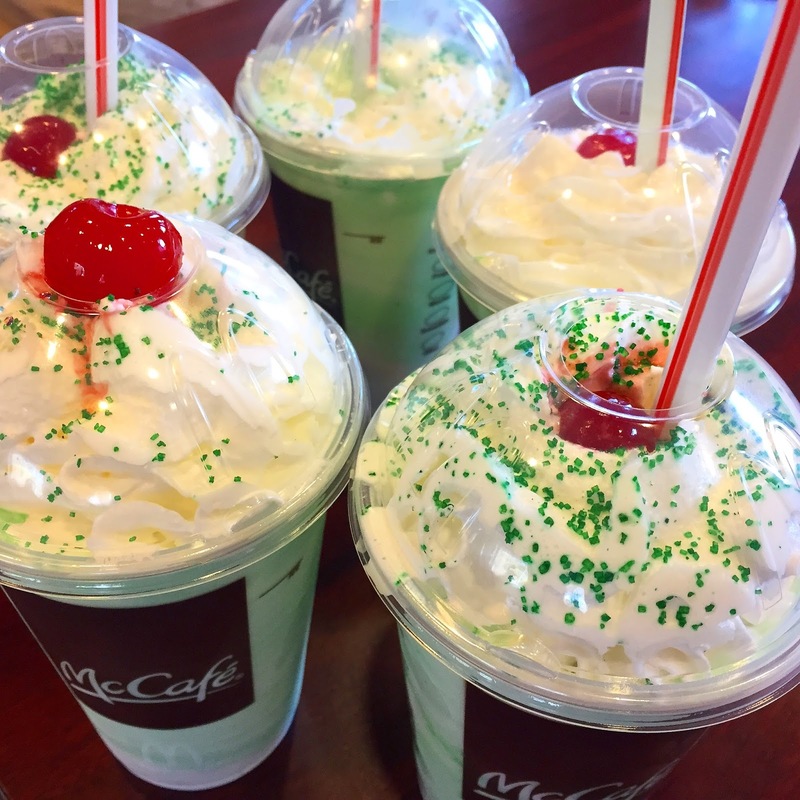 I pray your happy meal days will come. I send you a huge hug and Lily's name out of French fries! love you! 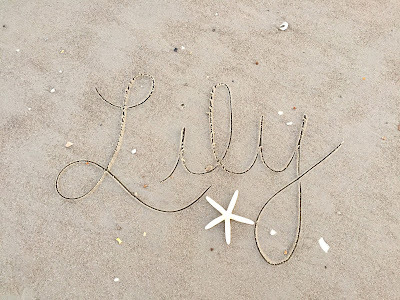 Think of Lily all the time!" 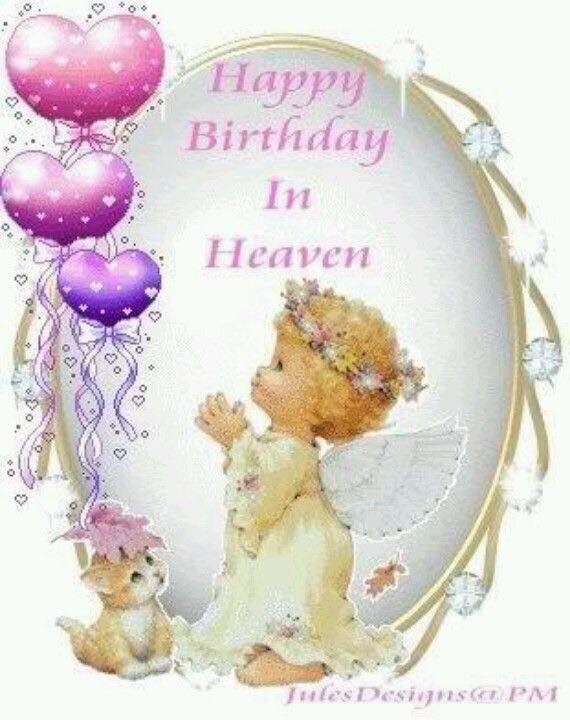 Naomi in Canada sent me this and wrote: "Happy Birthday in Heaven, Lily Katherine! You are so loved... Remembering you today with your mommy, family, and friends." Shanta in California wrote Lily's name in chalk for her birthday. 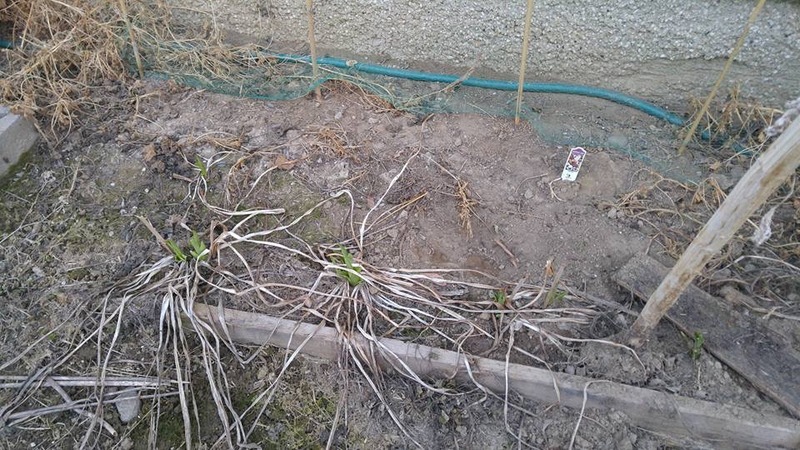 April in Canada sent me this and wrote: "Our daylilies are coming up and I thought of you and your LilyKat today. 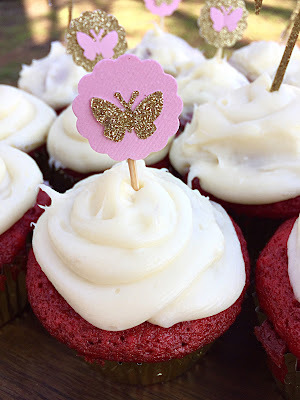 Happy 7th birthday to your Lily-girl!" Elise sent me this and said it looked like a little "L" for Lily Day! My Aussie friend Karen sent me this. Cat sent me this. 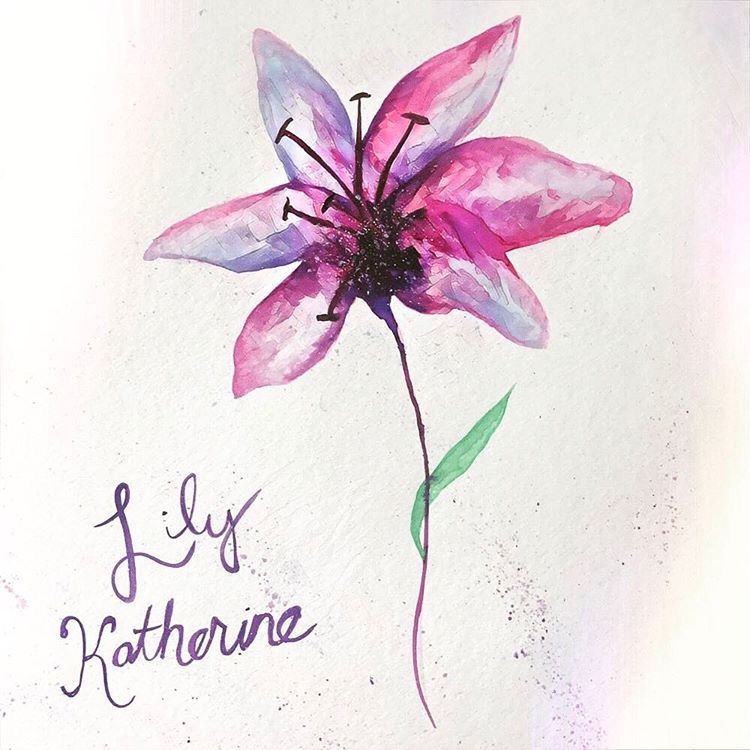 She said she knows she never met Lily, but through my life and how I honor her, she feels like she knows her. That's one of my favorite things to hear! 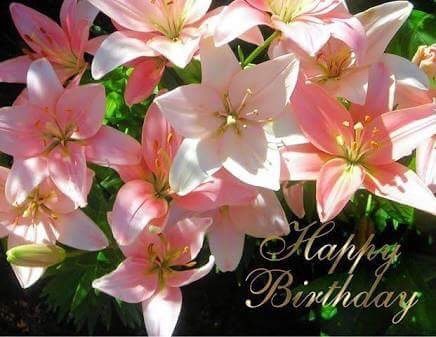 Amanda sent me this and wrote: "Sending birthday wishes to Heaven for beautiful Lily. I can imagine the celebration she is having. Dancing in a garden of gorgeous flowers and all the beautiful angels singing to her. I know she is proud of you! 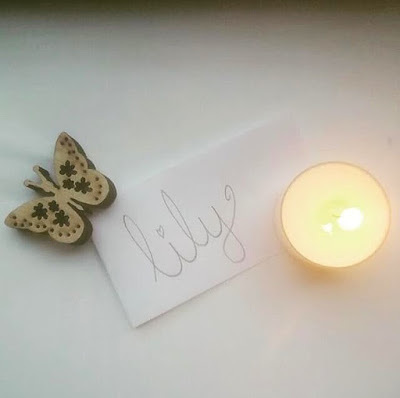 You have helped so many angel mamas, and your Lily has helped welcome and comfort our angels in Heaven. Sending so much love!!" What a blessing to read! Those videos are precious. I love hearing all of your voices and seeing you all in motion. It's like meeting everyone. Wow! That feeling is like what we're missing with our children that we never beheld alive in our arms. 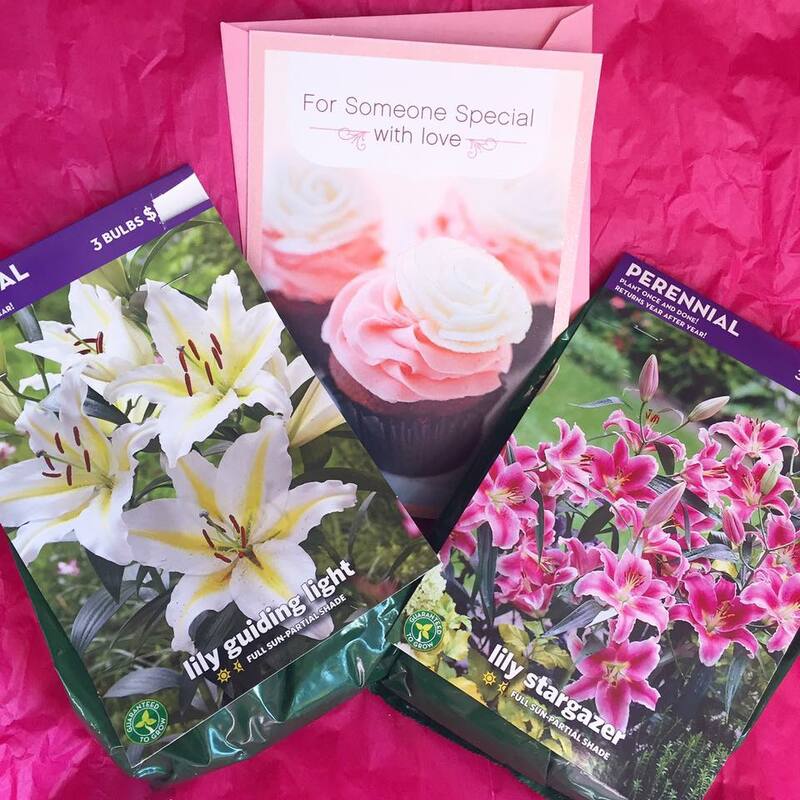 Celebrating these special days is like trying to grasp that feeling through all of these special remembrances and love gifts. 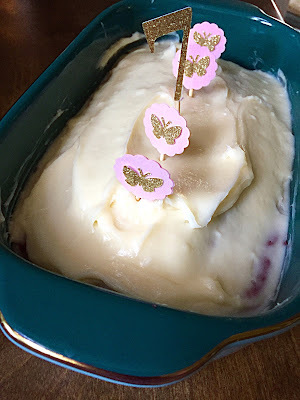 I dare say that God has blessed this special day for you and for those that shared it with you in person and for those that read...and will read...this blog entry. 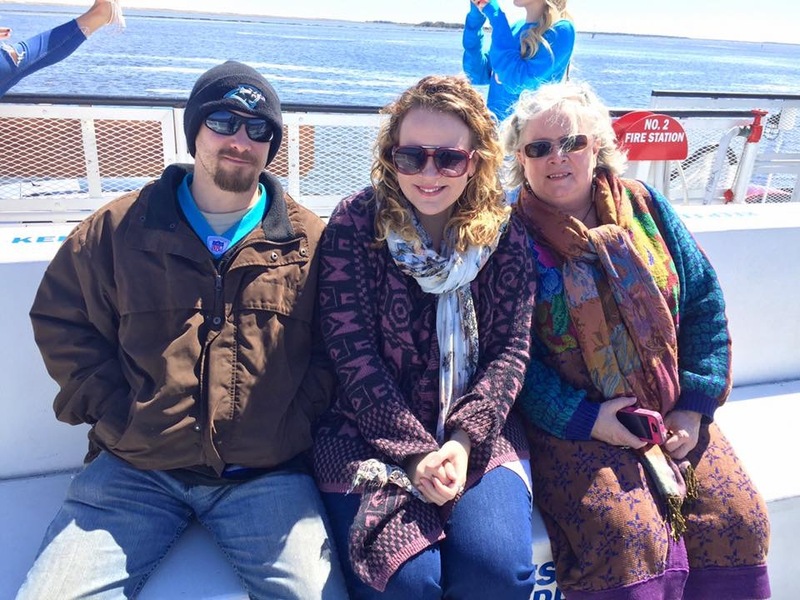 Praise God for the love of friends and family! Praise God for the enormous love of our Savior the Lord Jesus Christ who never leaves us nor forsake us! 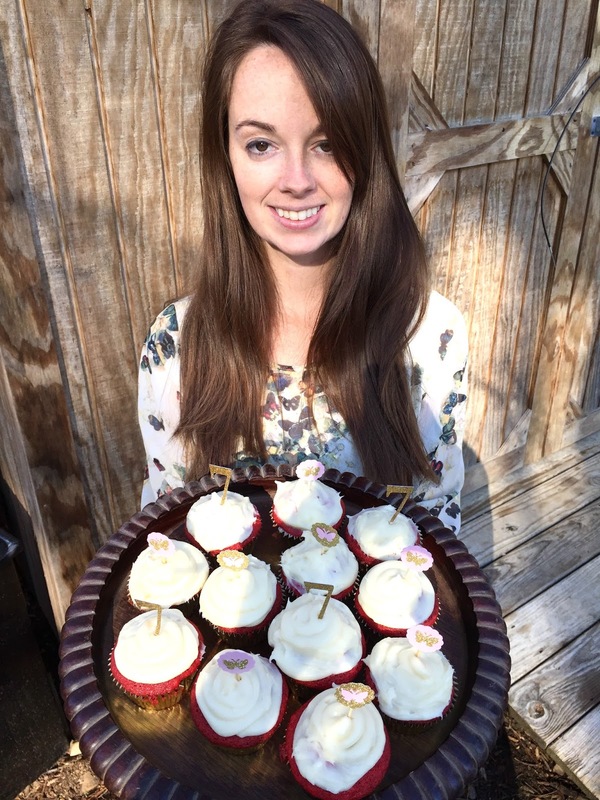 Hannah Rose, just got through reading your March tribute - amazing. What a beautiful amount of work! Precious and long lasting. 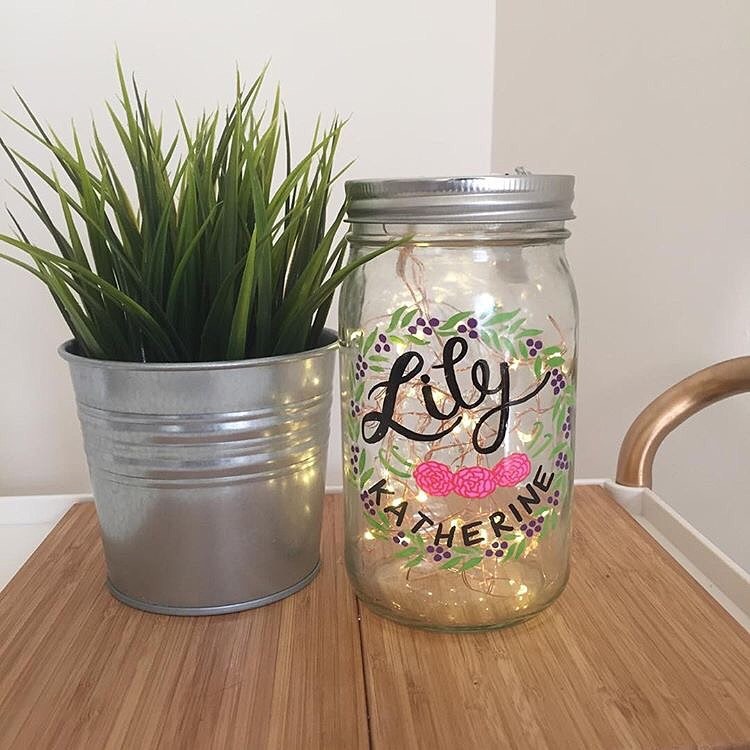 Lily is SO loved! This is absolutely amazing!! Beautiful. 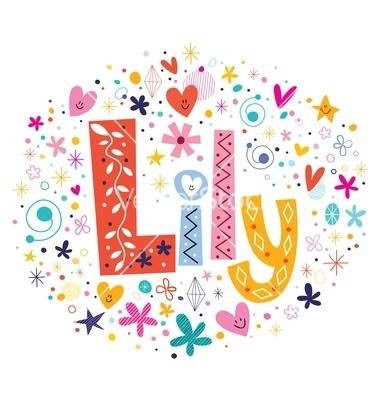 Lily is such a special and loved child.